Figured it's about time to start doing something with these pictures i've been taking. Plus maybe this will get me to start taking more pictures of stuff I am doing. There's alot of gaps and stuff I never took photos of. 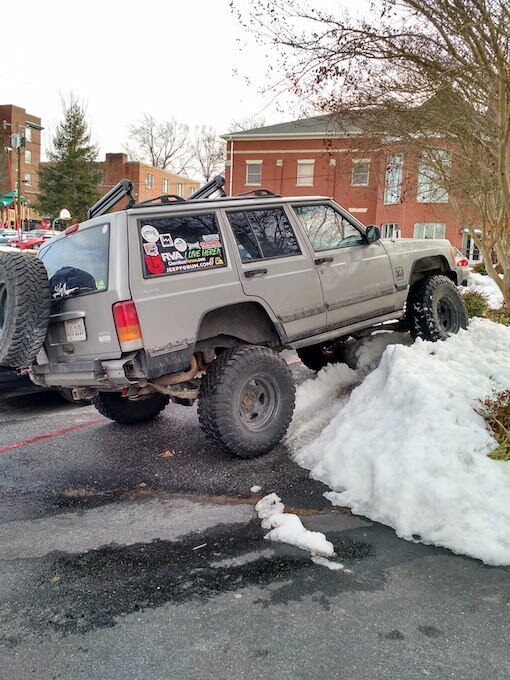 It stayed stock for awhile (minus some sweet stickers), and got me around town and up to mountains. 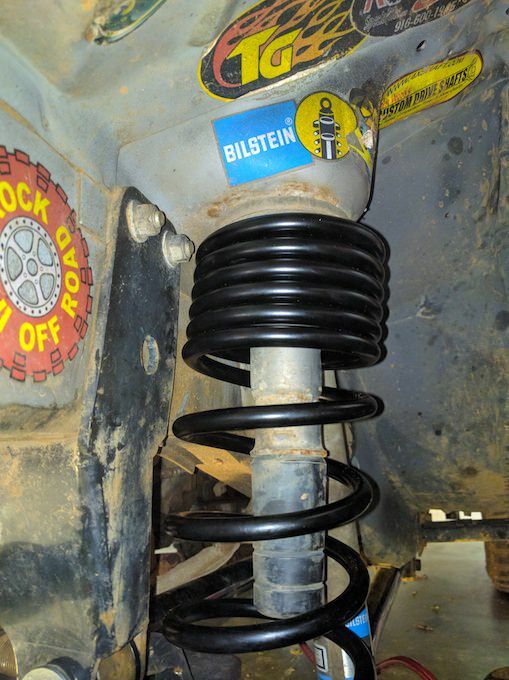 Sometime in early 2011 I installed 3" Rough Country lift (springs & AAL w/ shocks) and around May 2011 I picked up some used TJ Rubicon take-offs. About a year later, finally upgraded to some proper 31" MTRs and Crager V-5s. 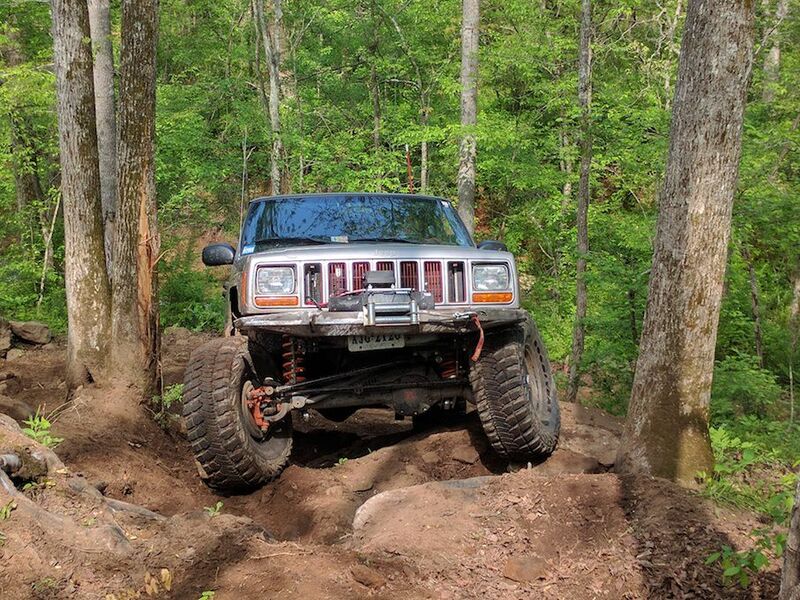 Spring of 2012 I went on my first official wheeling trip to Wheelin' 4 Hope at Oak Ridge Estate. Got a little squirrely through "puddle" and slid off the trail into a tree. 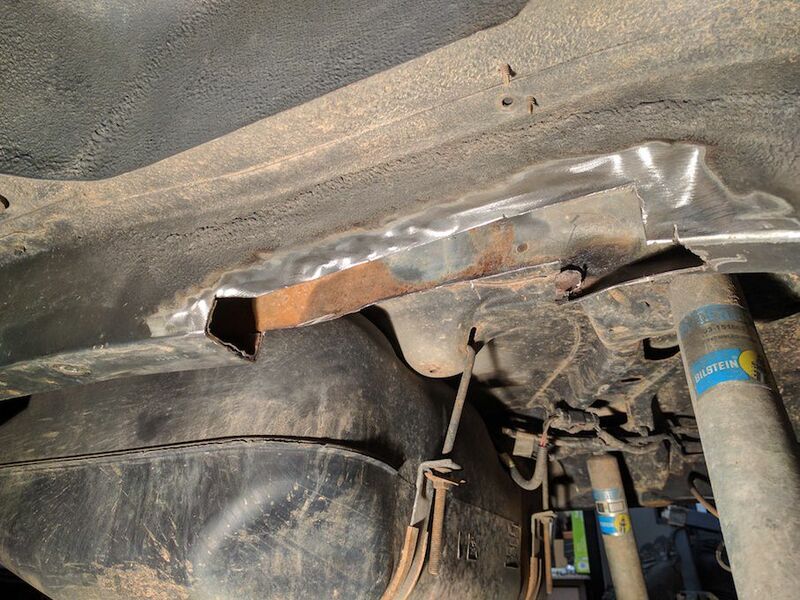 Blew out the headlight and put a branch through header panel, 1" away from going in the radiator. At spome point during 2012-2013 I went through a few lift changes. Added Clayton 4.5" coils, IRO adj. 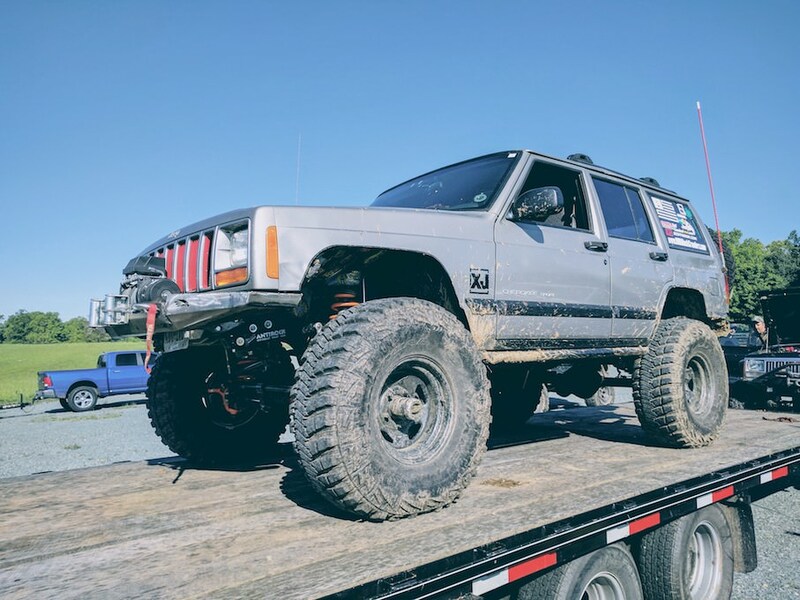 upper & lowers, IRO Double-Shear track bar, IRO 3.5" Leafs, 1" JKS Shackle, JKS, Sway-bar disconnects, Serious Offroad 1-ton UTK, SkidRow engine/trans skid, JCR Offroad Rock Sliders, and a stock XJ gas tank skid. 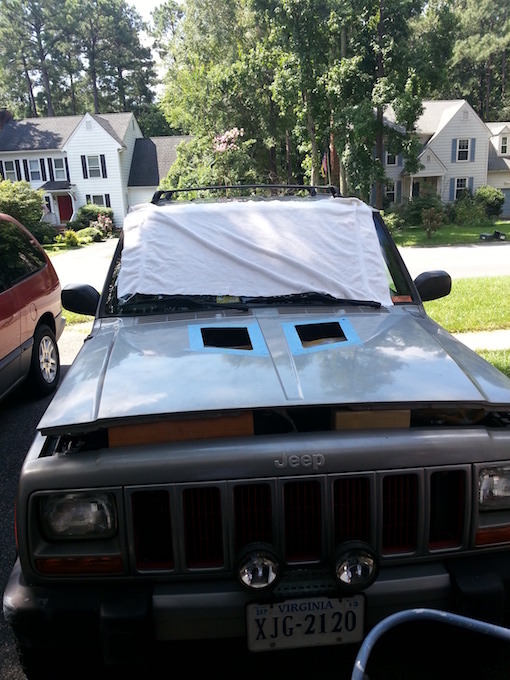 The only pictures I managed to find from this time was from around mid-2013 and I added some RunCool XJ hood vents. After a couple months of having nothing but issues with the adj. 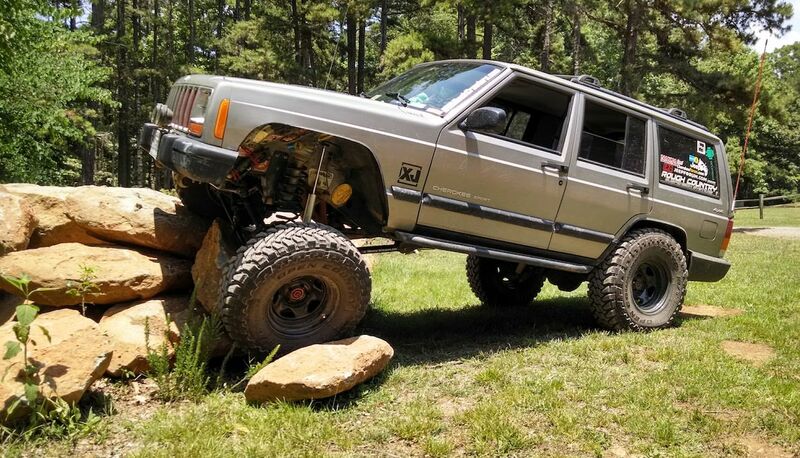 short arms, I bit the bullet and order the Rock Krawler 3-link upgrade. 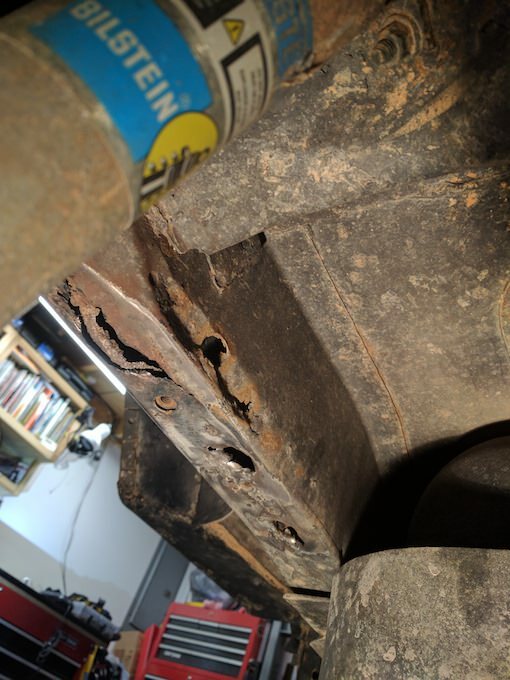 The whole "bolt-on kit" wasn't really bolt on. 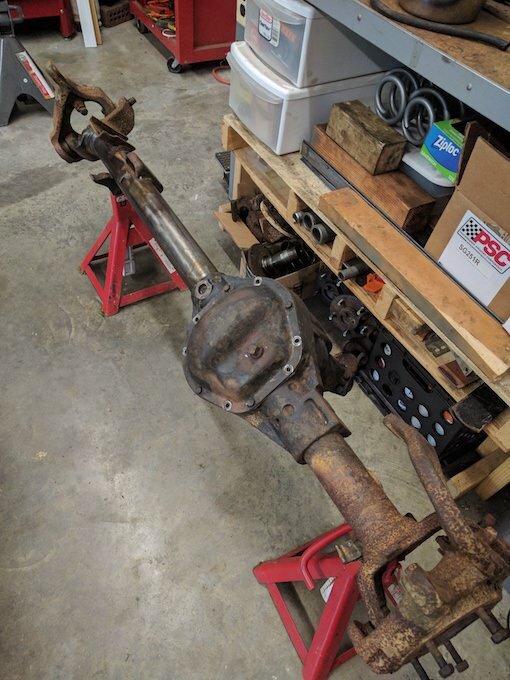 Pulled the stock Low Pinion Dana 30 and replaced with a High Pinion 30 I rebuilt. 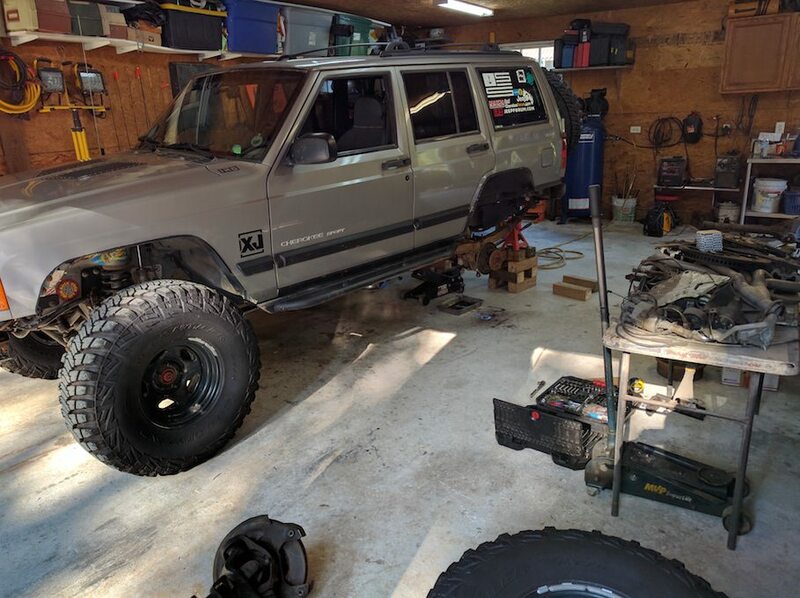 New axle, calls for bigger tires! 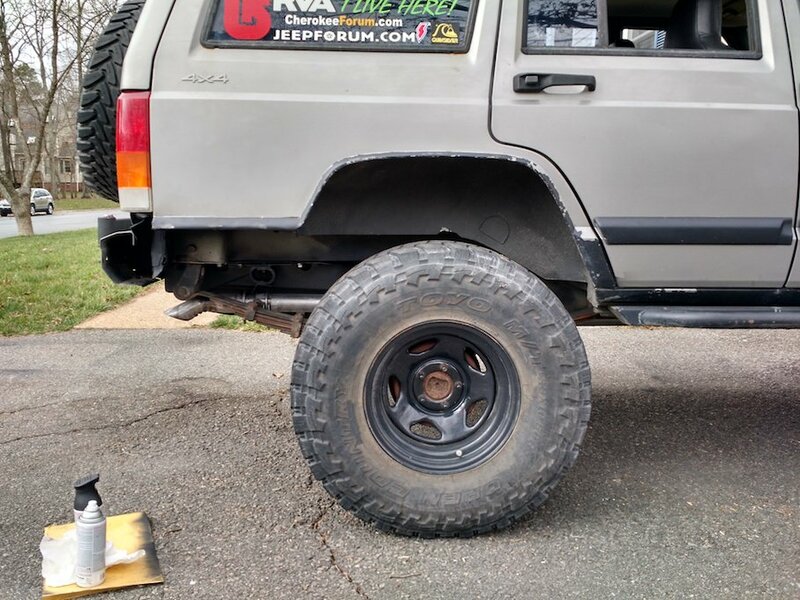 Move to 33s, Toyo MTs 33x10.5"
DetoursUSA Tailbone installed, after 5 months of waiting for it to arrive. Added an add-a-leaf into the IRO 3.5" leafs i'd been running. Here's just some pictures from 2015. 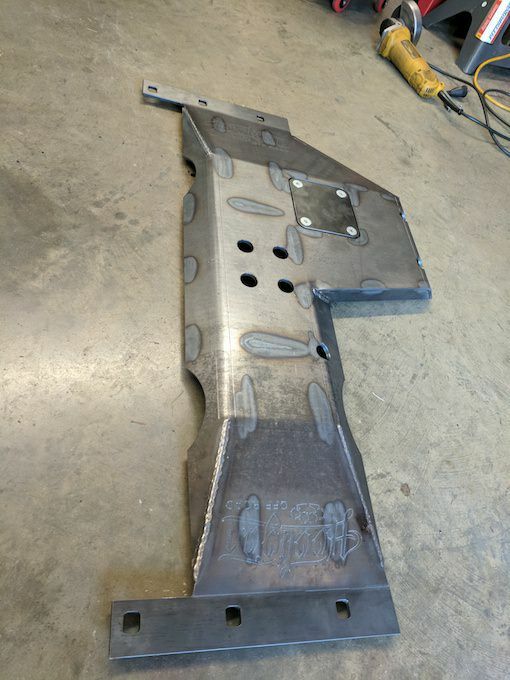 2016 rolled around and I cut and folded the rear fenders. 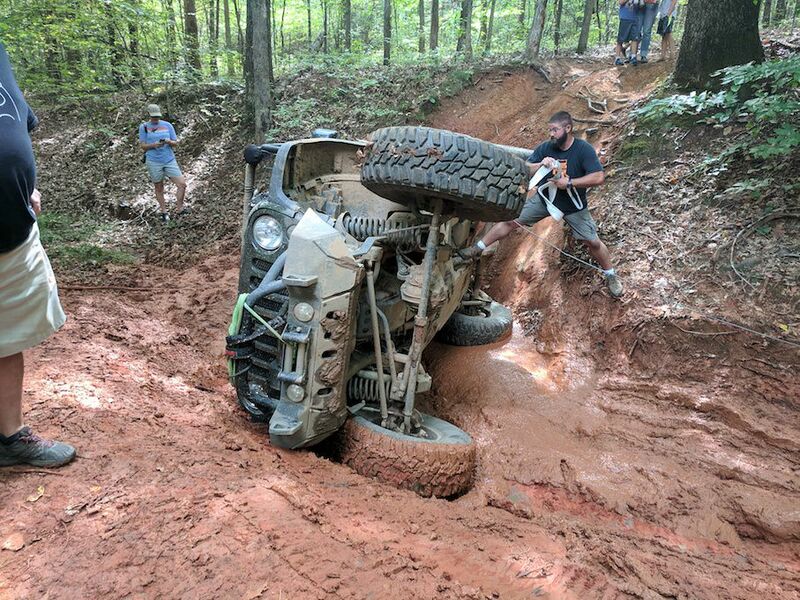 35s were inevitable. 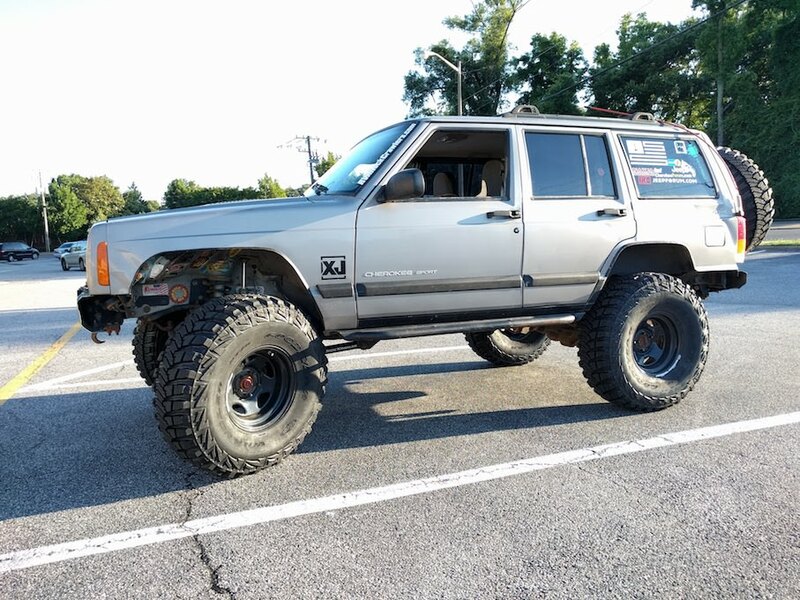 Wasn't a huge fan of the Toyo's and decided to go back to the MTRs 35x12.5". 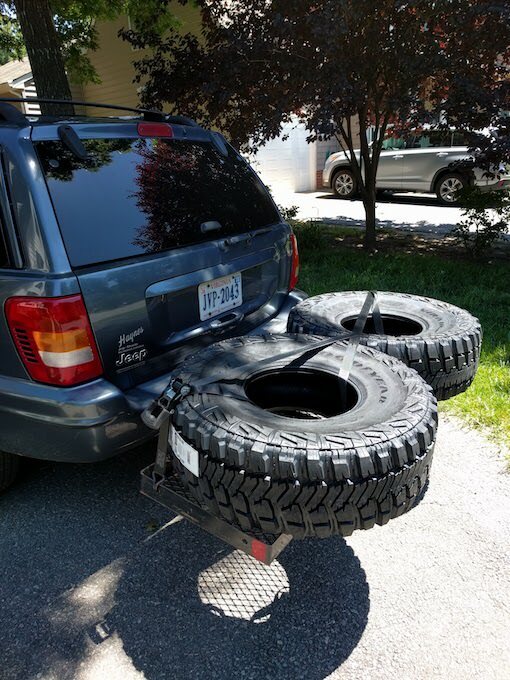 Got them installed just in-time for our annual Uwharrie trip. And afterwards I realized how much I needed to re-gear. 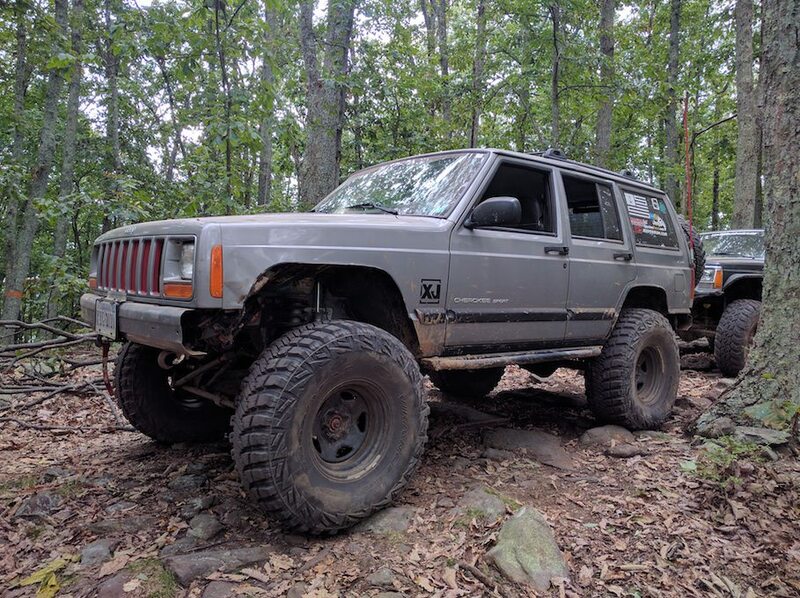 Found another HP 30 and a friend had a XJ 44 trade me for my 8.25" that was coming out. 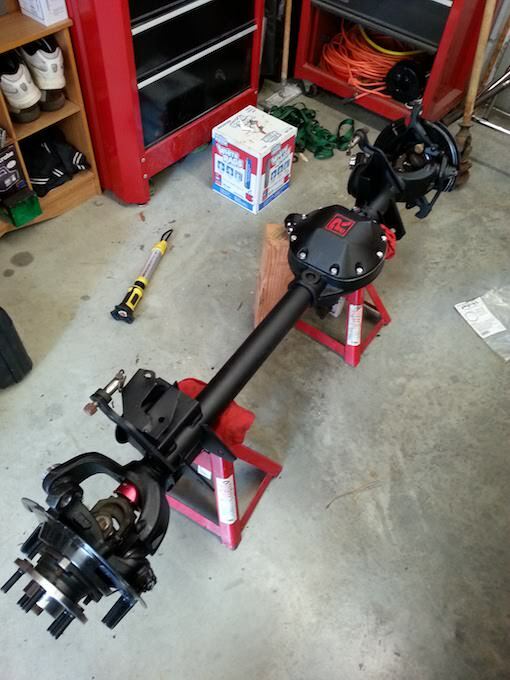 Trussed the new Dana 30 with the IRO Dana 30 truss, installed Yukokn 4.56s and a Grizzly in the rear. Did all this 3 days before leaving for VA4WDA Annual trip at Oak Ridge. 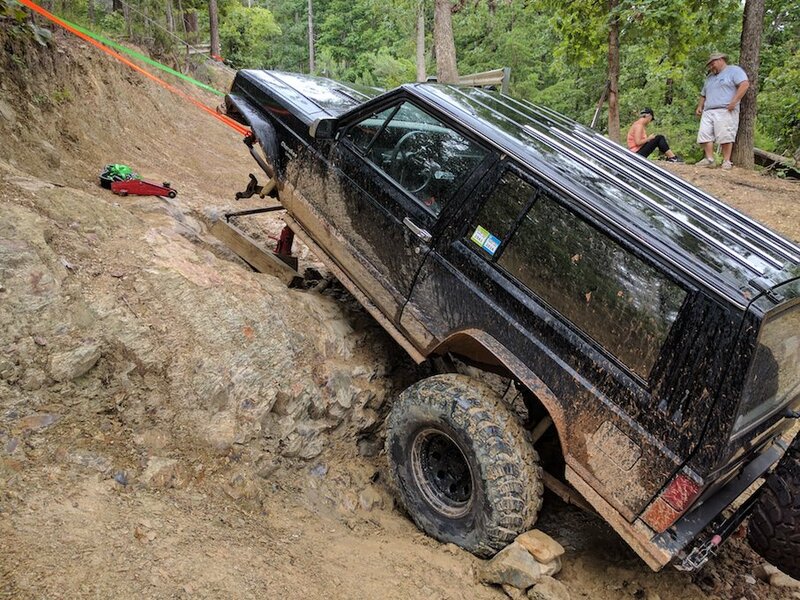 Was feeling pretty happy with it on that trip, and the what a different a locker makes and new gears. One thing I discover once I got on the trails was this awful screech/squel. 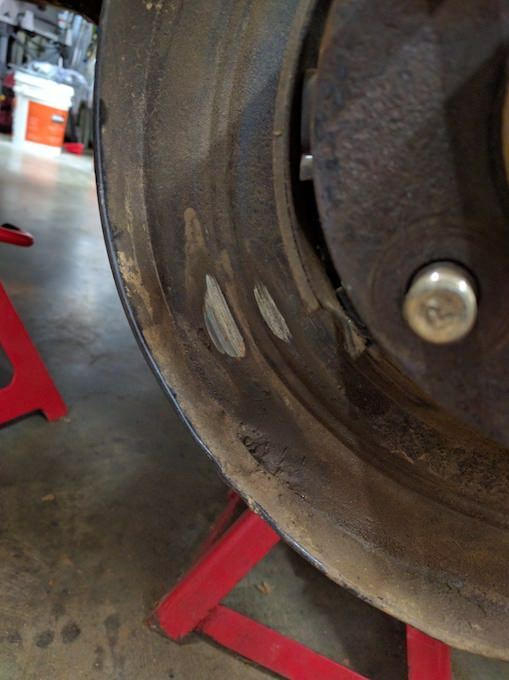 Turned out when we installed the rear axle, the brake dust sheild must have gotten bent and was make some good contact with the rotor. 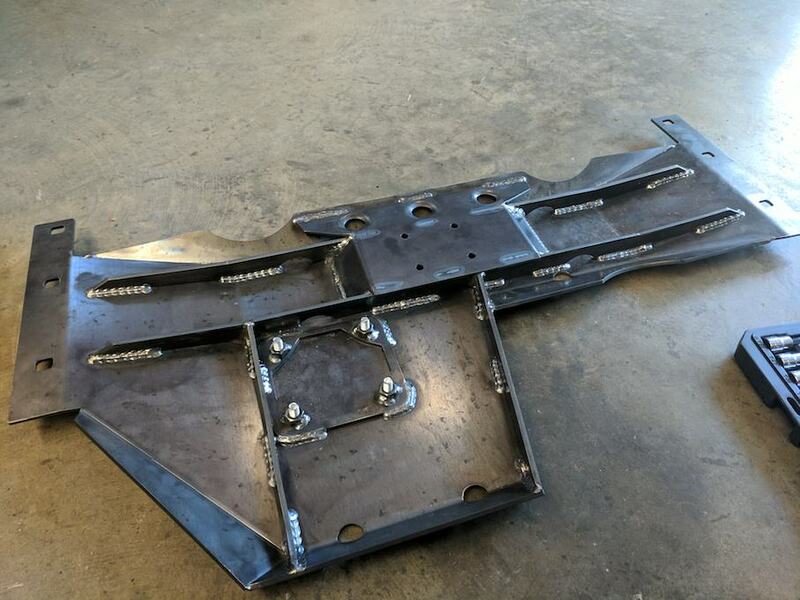 Towards the end of 2016 I installed a Ironman4x4 Fab Steering box brace, and this is how the front end look around that time. 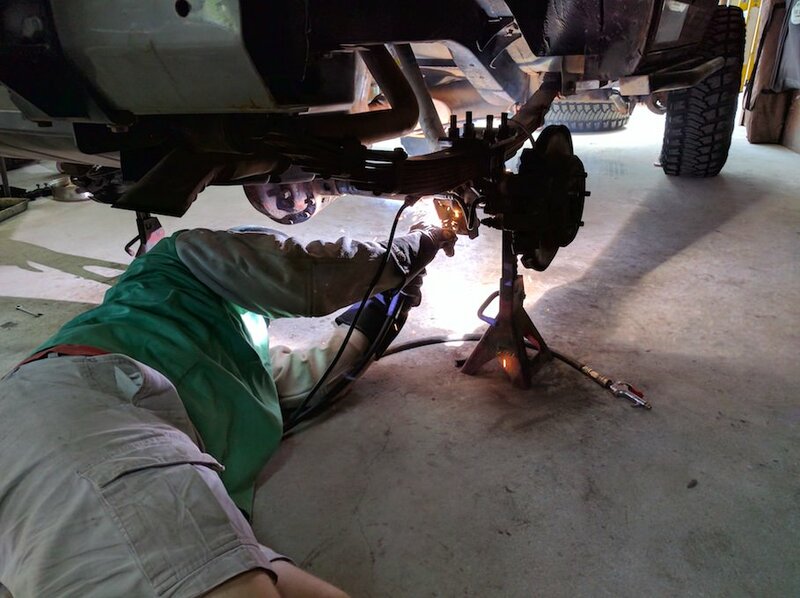 I never really cleaned & prepped the axle well when we installed it. 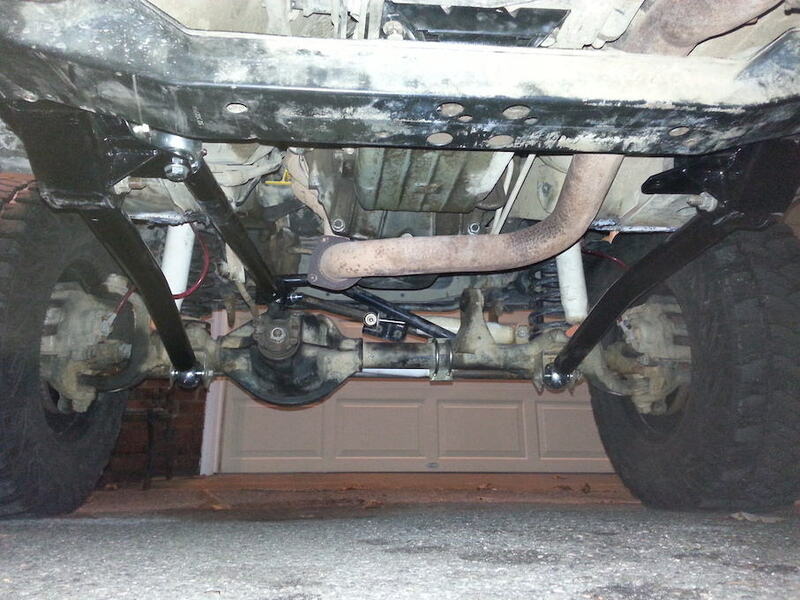 I wasn't very happy with how tall the frontend was with the 4.5" coils and truss (added like 1"-1.5"). 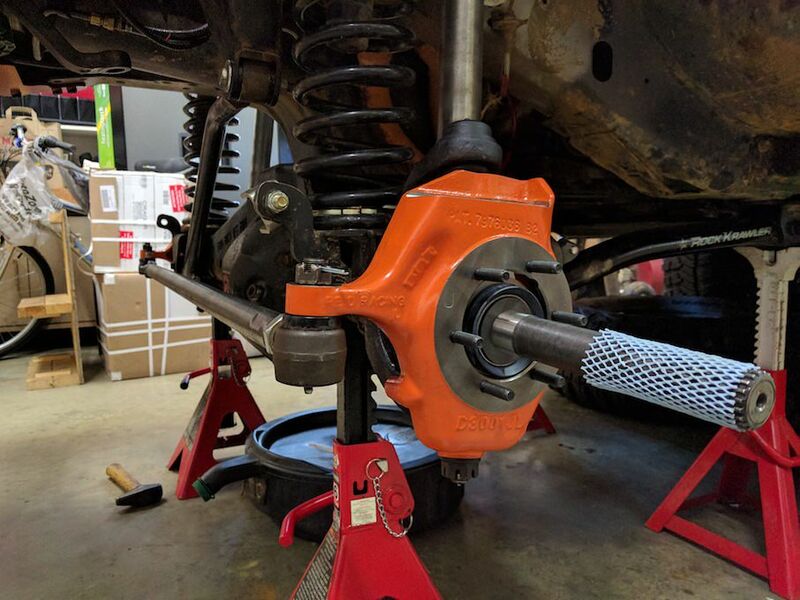 Decided to try out the MetalCloak Tue Dual Rate 3.5" coisl. 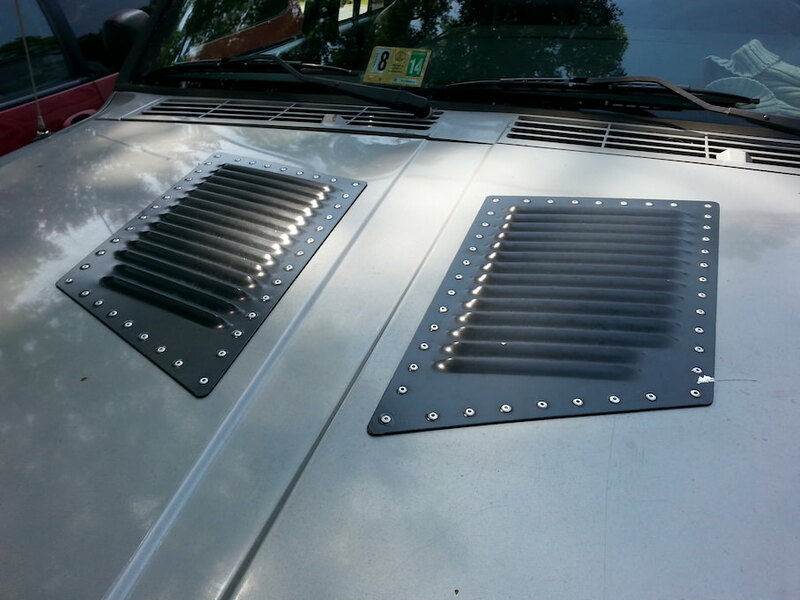 Looked very promising, but once I got them installed, I wasn't happy with them. The coil was larger in dia. 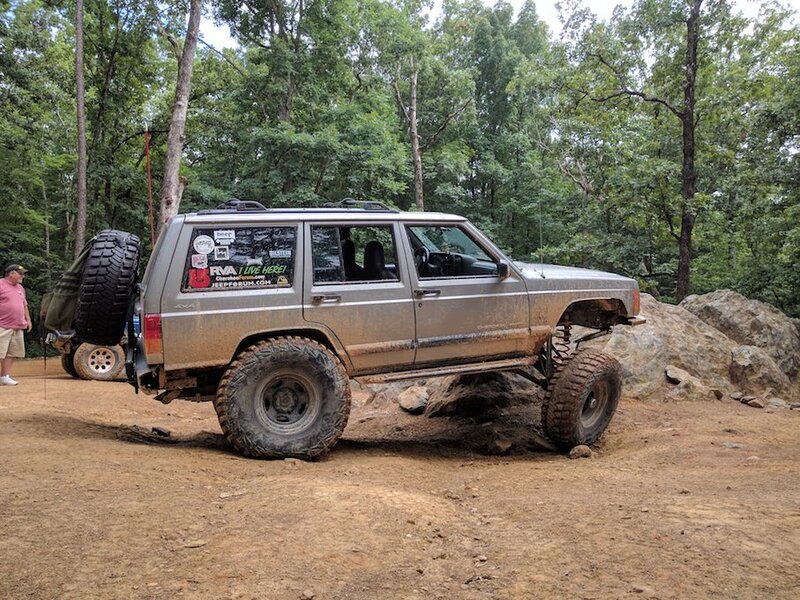 than other XJ coils and they rubbed the frame/trac-bar bracket. 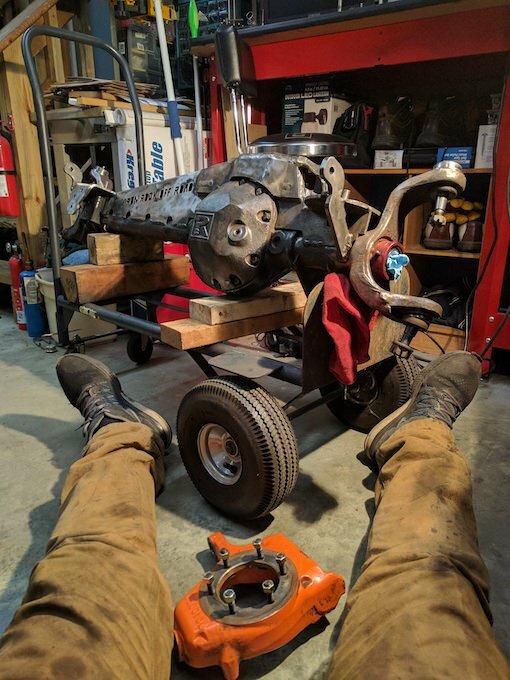 Another thing showed up from the axle swap, the driver shaft had a bum u-joint so we used a space my friend laying around. 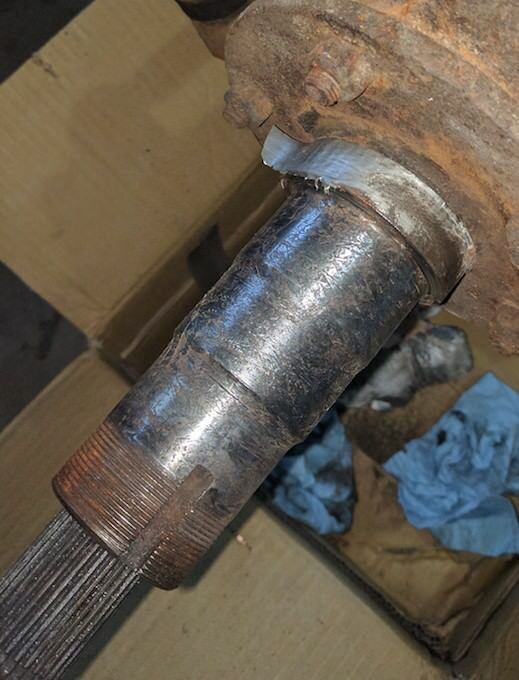 Well this one had a bum u-joint too and after driving on the interstate for awhile the friction from it heated the shaft up enough the inner seal blew and ovaled out the outer tube seal. Pulled the shaft and remembered this thing was funky when we put it in. 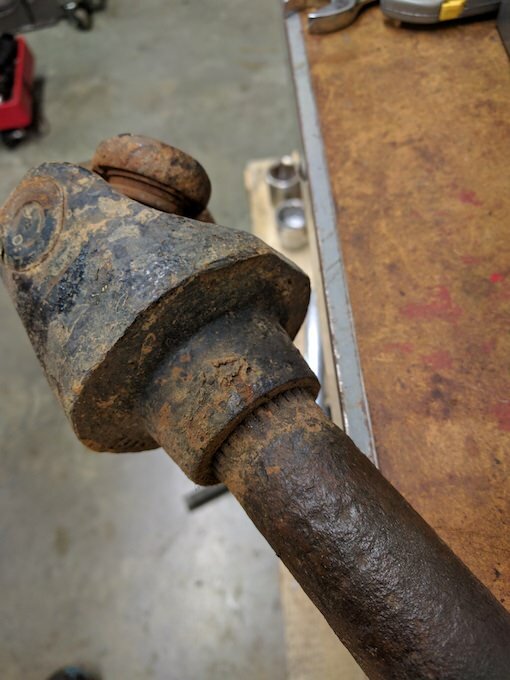 The shaft is splined and has the yoke pressed on to it. Never seen that before. After I pulled the shaft, these showed up! 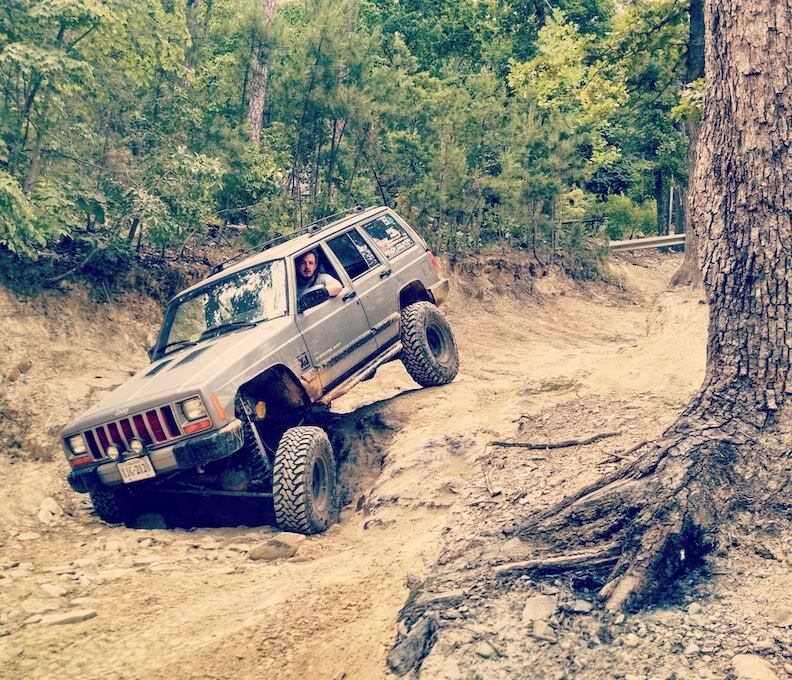 Since the front end was apart and ever since I put the steering brace on I wasn't running a sway-bar. Didn't like this so much. Went to over to new local 4WP and got a sweat deal on a Anti-Rock. 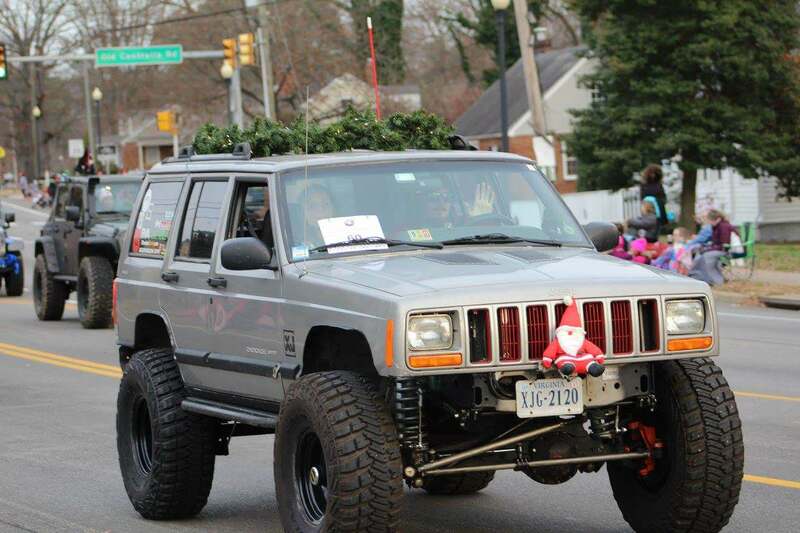 Decided to drive it Christmas parade with the Club. 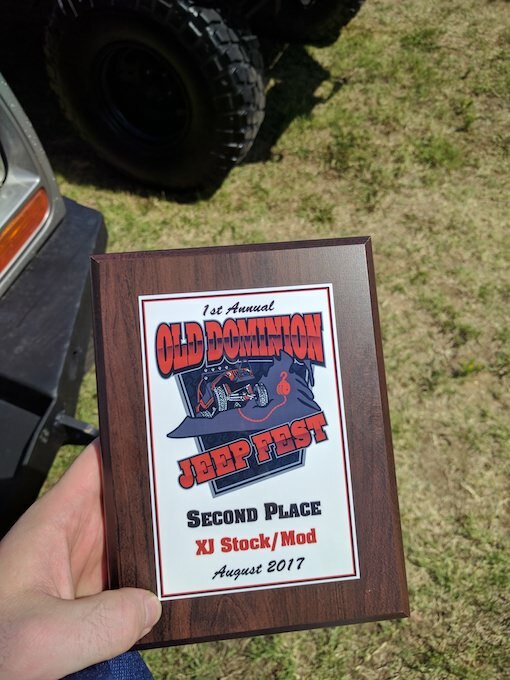 After entering the real world, the Jeep has been parked for awhile since it's not the DD anymore. 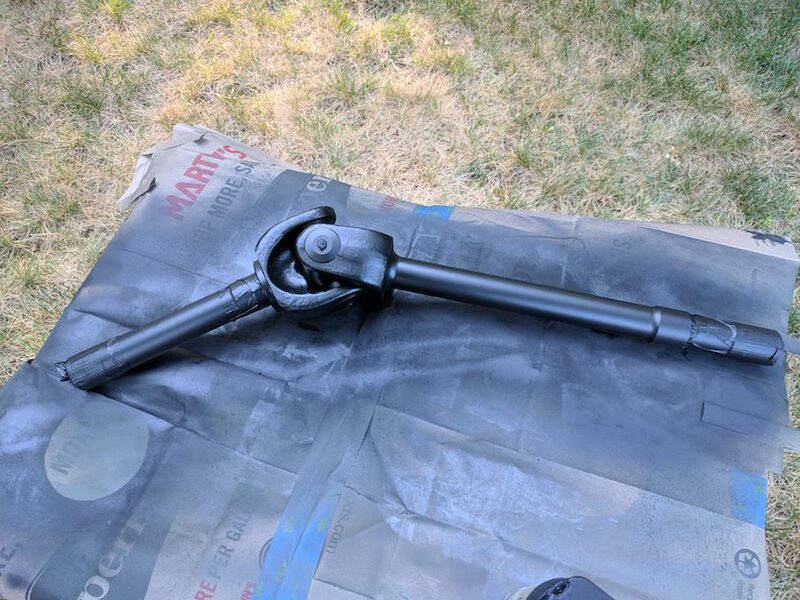 Decided to tackle the rust that been eating at the frame where the bumpstops in the rear went. 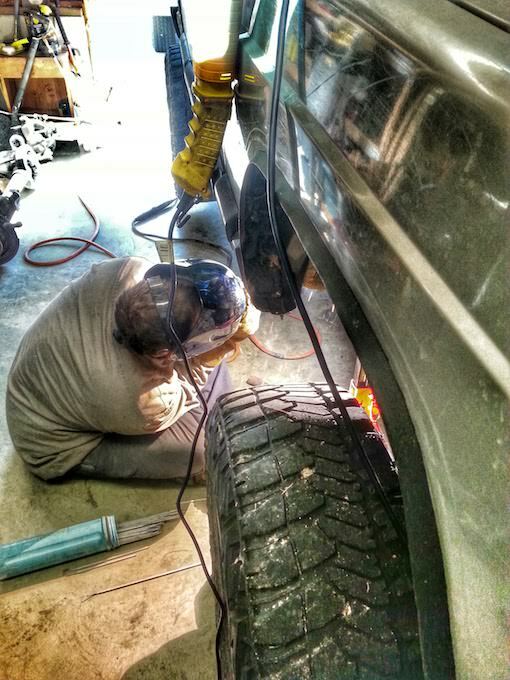 And while i'm here... might as well pull the axle out and give them a nice clean-up. 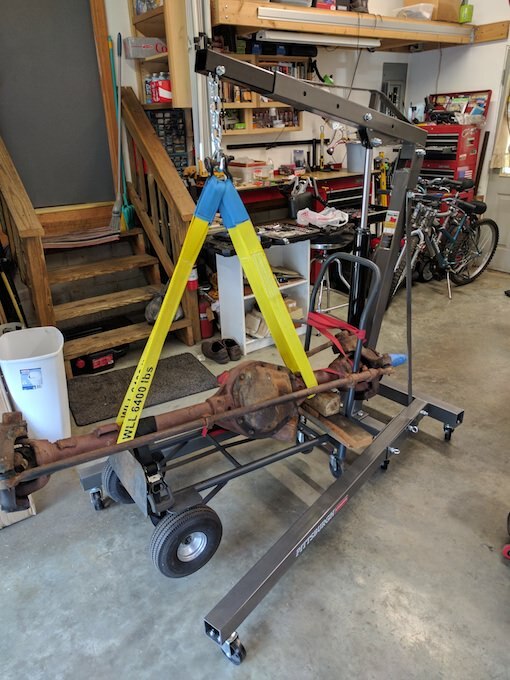 Got the rear frame fixed up and then got the axle back in. 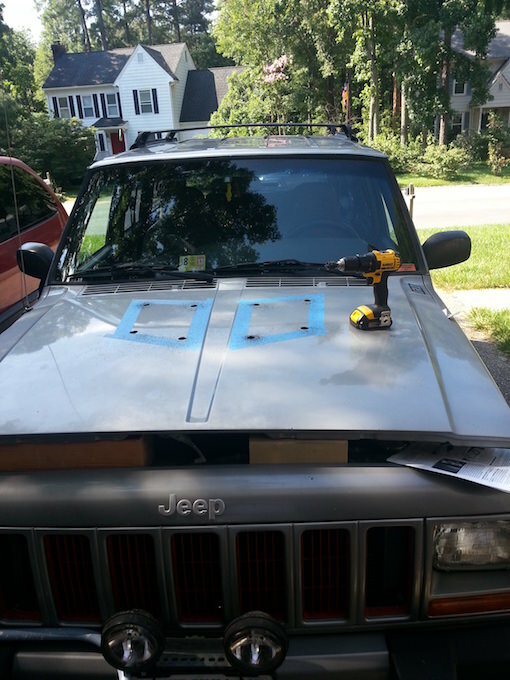 Next up was a winch & winch bumper. 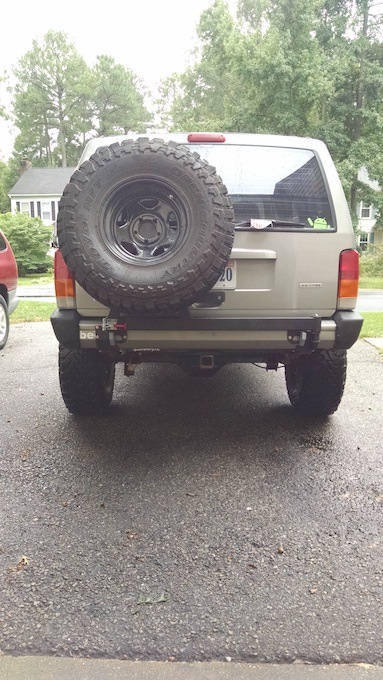 Went with the Dirtbound DIY bumper. 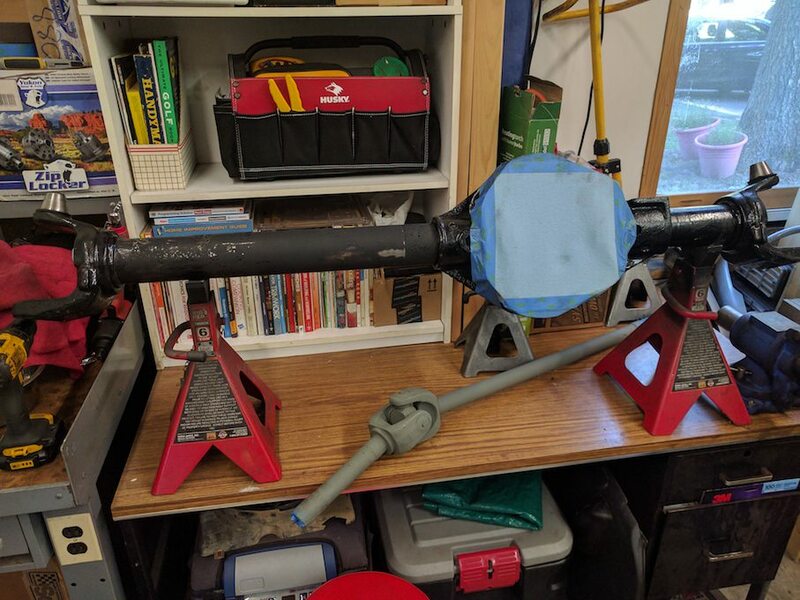 T-Case started to leak, and I picked up a used NP231 with a Tera-2low installed already to rebuild. 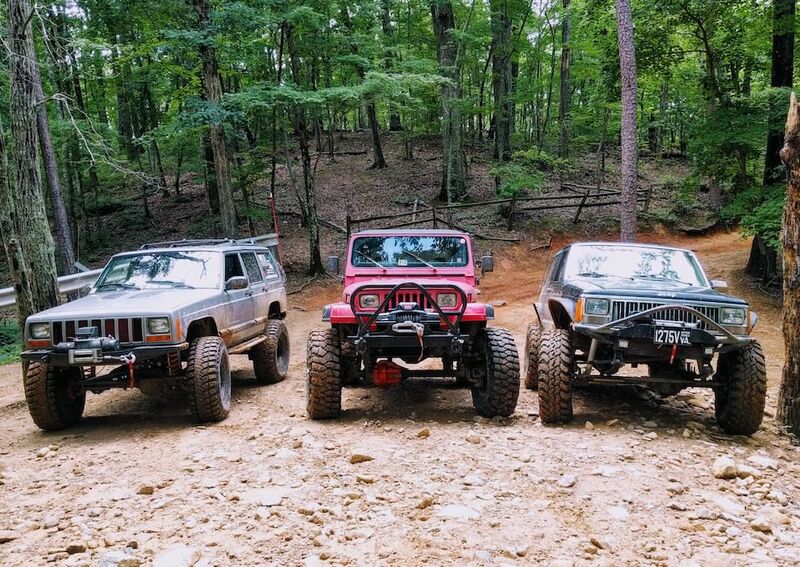 Went down to Uwharrie this past summer. 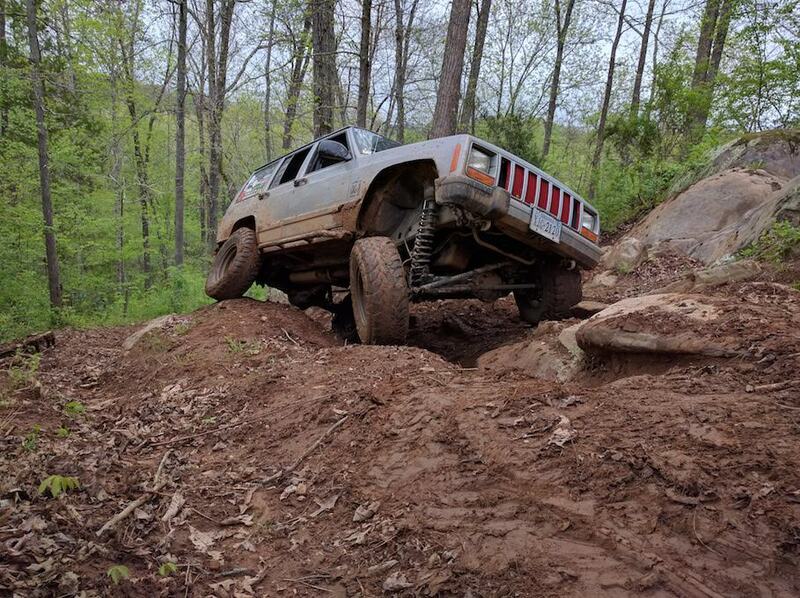 My buddies XJ didn't fair so well going up the lower ledge on Daniel trail this year. 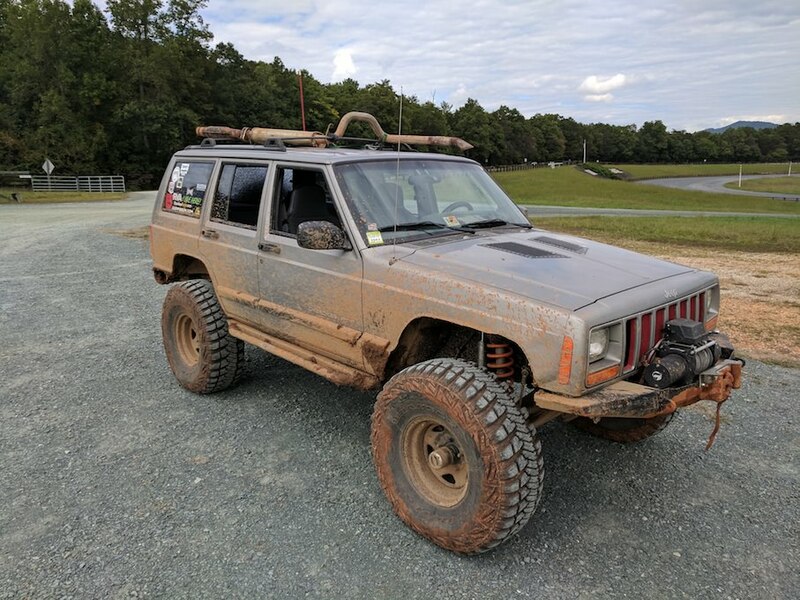 For anyone who is interest in the free-spin/Reid Racing knuckle swap, this is the part list I gathered when I did mine. 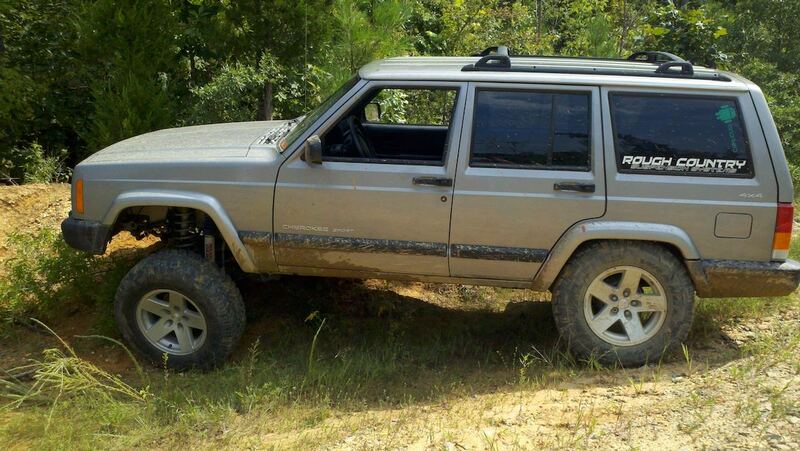 It's definitely alot cheaper if you can source some used parts, but some stuff you just may have to go new on. Looking back on it, I may or may not have done it again. 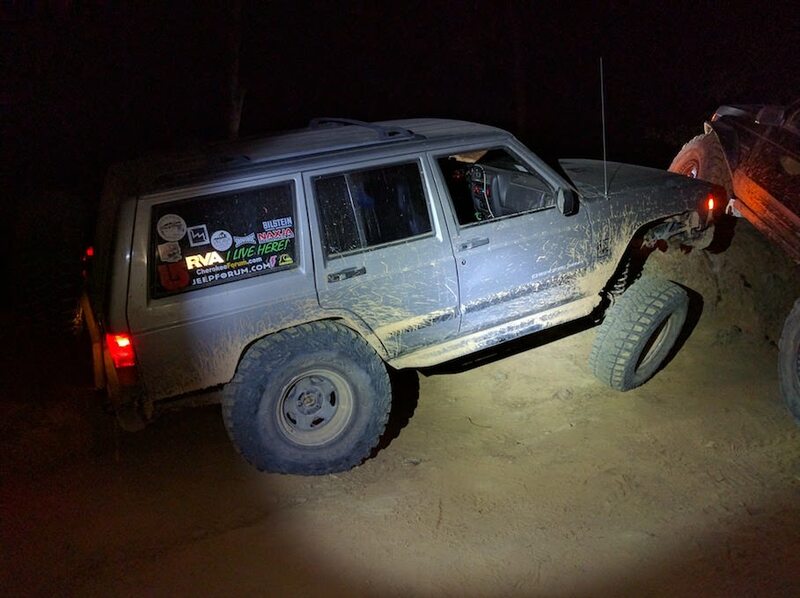 After getting everything installed, it was still a 30 just with select-able hubs at this point. But I will say it is very nice to be able to do 70 mph down the interstate and not have the front end spinning. 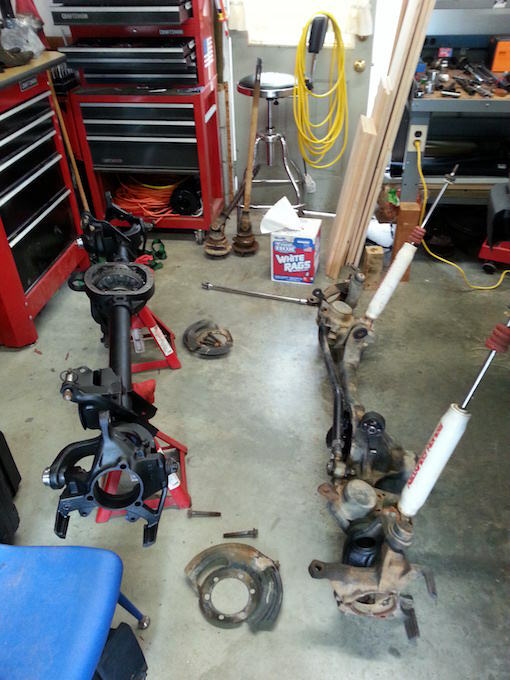 All of this lead me into my next bad decision of pulling this axle out and doing a 44 swap or maybe something bigger. I felt your pain, and still do haha. 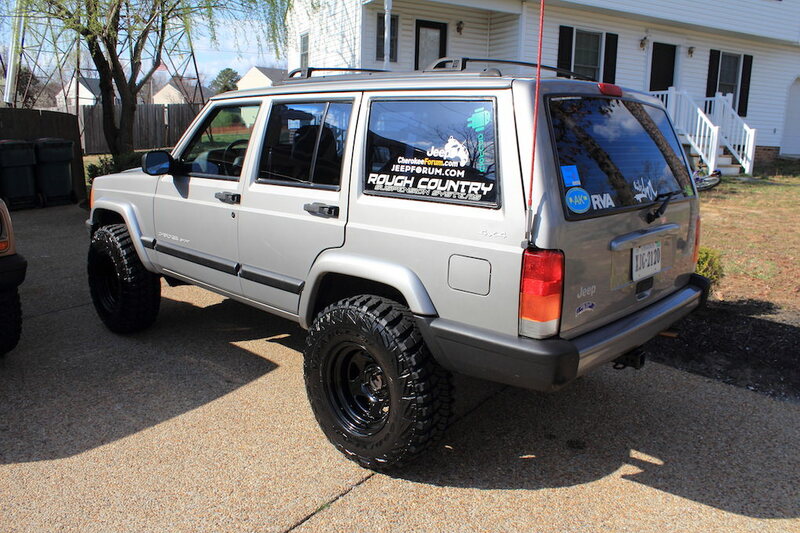 I have a good idea on what i'm doing to run the 37s, the info will be coming soon. So here is where my mind started turning. 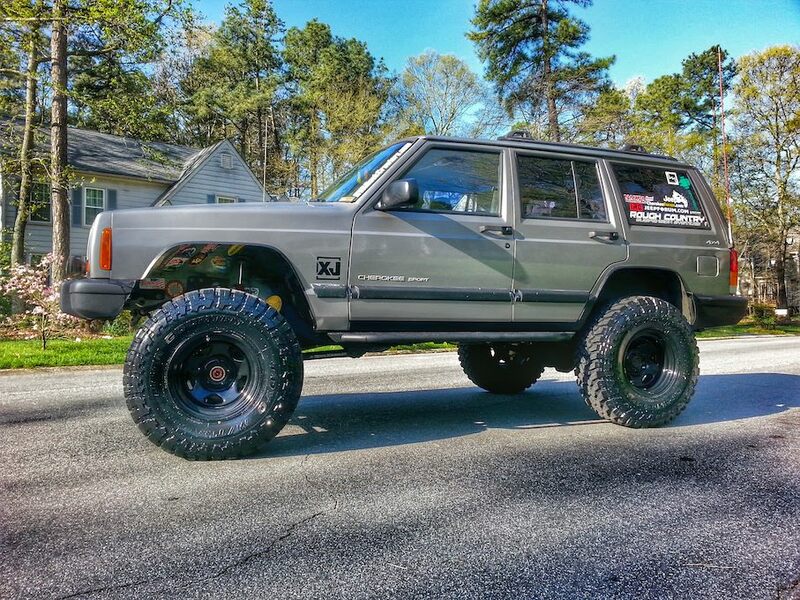 It was time to move on from the HP 30 and go to something bigger, as I wanted to lock the front and go up to 37s. I couldn’t justify making the HP 30 work and putting more money into it, than I already had. 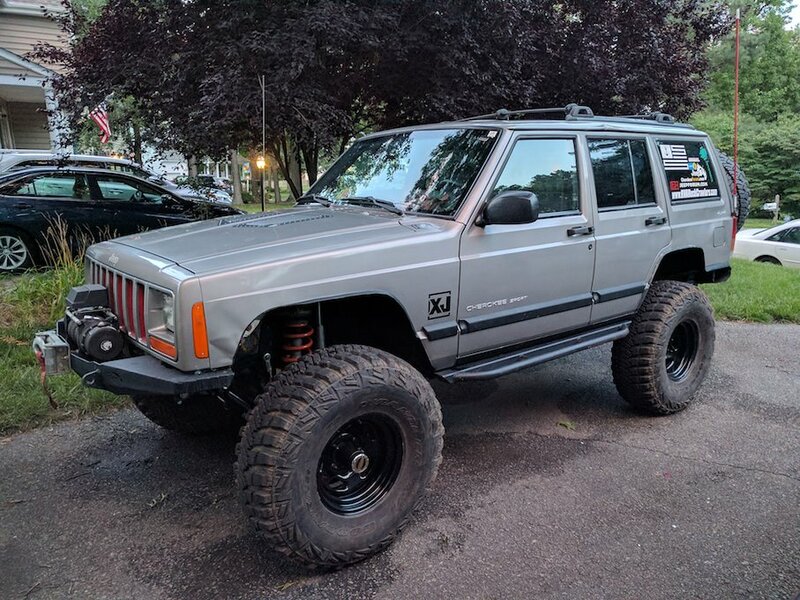 I thought about picking up a Rubicon 44 and that way all the Reid knuckle stuff would swap, but realized I wasn’t gaining a lot. So I decided to look for a real 44. 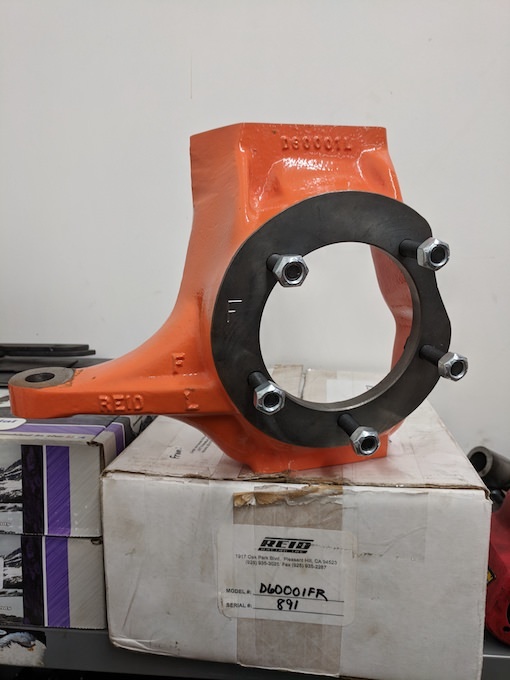 It’ll have the same u-joints as the HP 30, but figured everything else was an update. 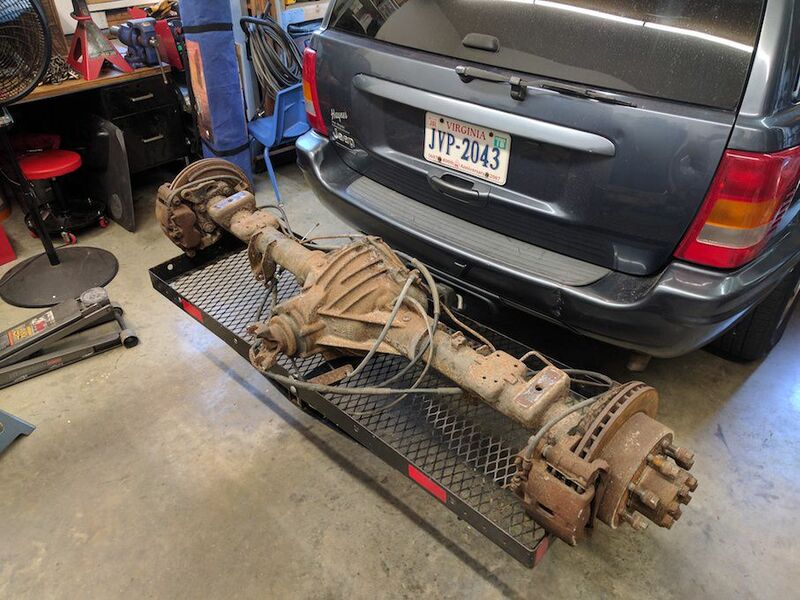 I knew I was looking for a High Pinion Dana 44 from an early 70s Ford with the welded wedges, or leaf perches; I didn't want to mess with the 78/79 cast wedges or a Waggy 44 as those are low pinion and some had the 6x5.5” bolt pattern and I was already running 5x5.5”. 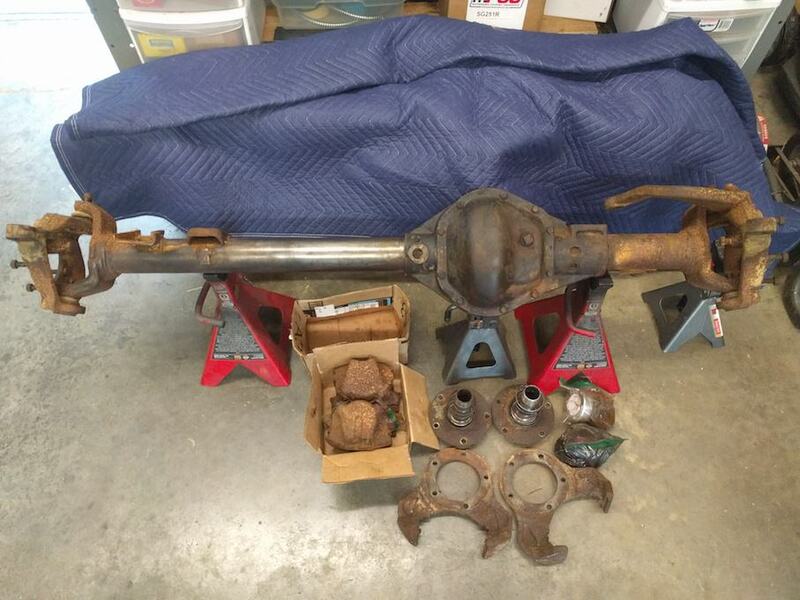 I found someone locally, who was selling a HP Dana 44 from a 79 F150, but it head leaf perches and 5x5.5”. This was interesting as I didn’t know this existed. 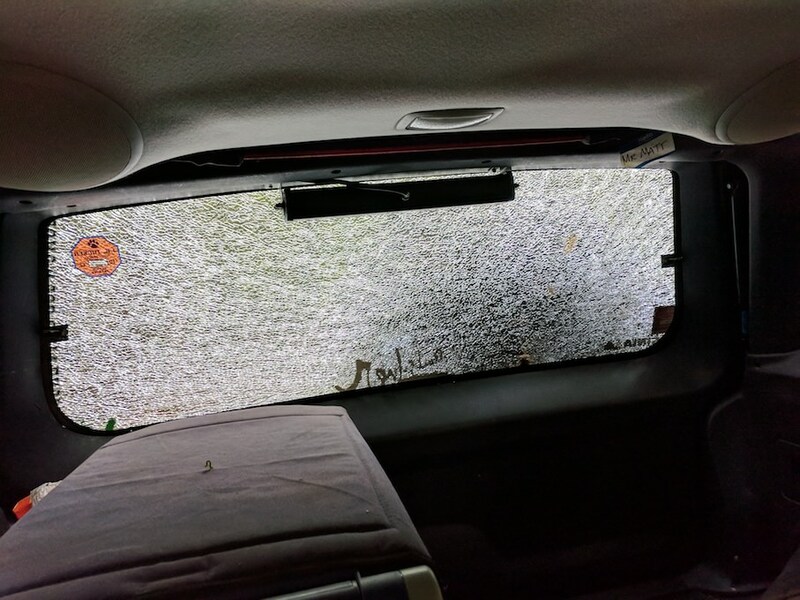 Turned out it was from a 1979 F-150 Super Cab. 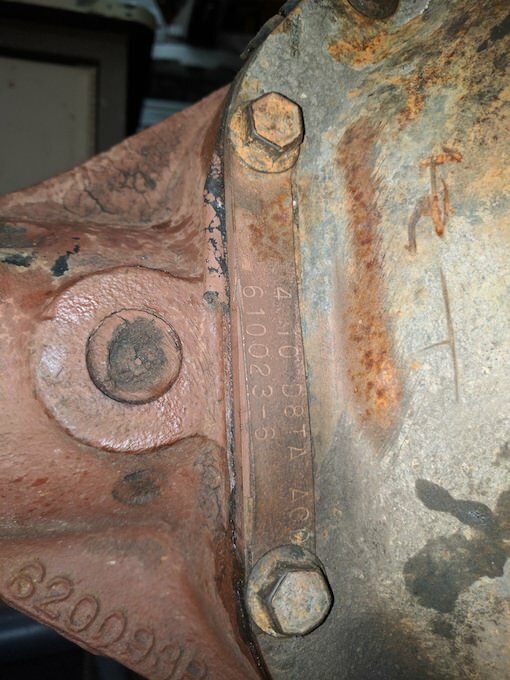 These were leaf sprung, not coil sprung, and had the 5x5.5” bolt pattern, even though the axle from the C’s inward are the same as the F-250 leaf sprung 44s from the same year. 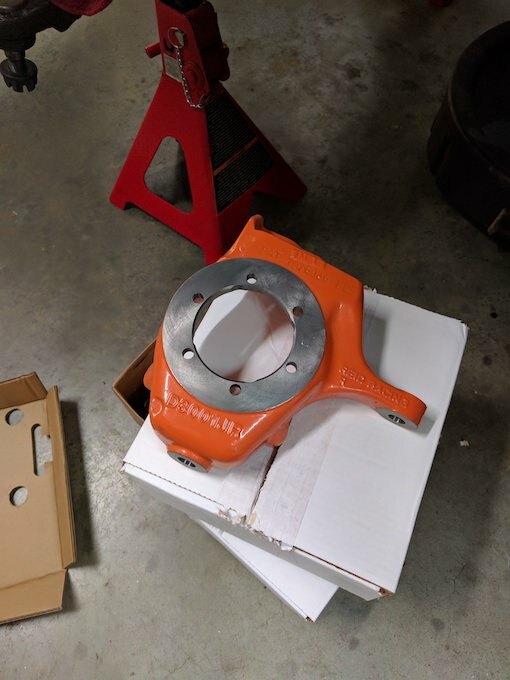 That being said, these have a wider WMS than regular F-150/Bronco 44’s from pre-77 and actually measure the almost same as the 78-79 Snowfighter Dana 60s. 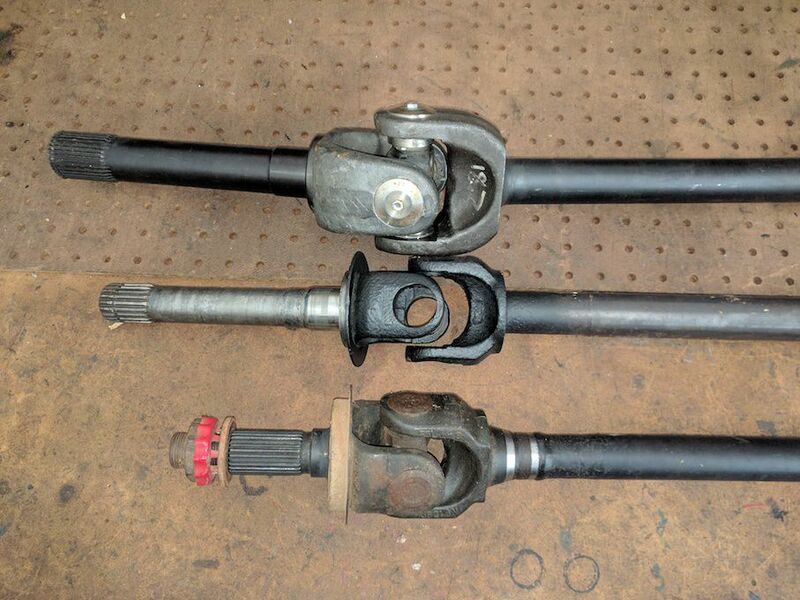 They are little short due to the different length in stubs/hub, but the inner axle lengths are almost identical. Tubes are 3” in diameter and 0.50” thick. The BOM for my Super Cab 44 is 610068-2. 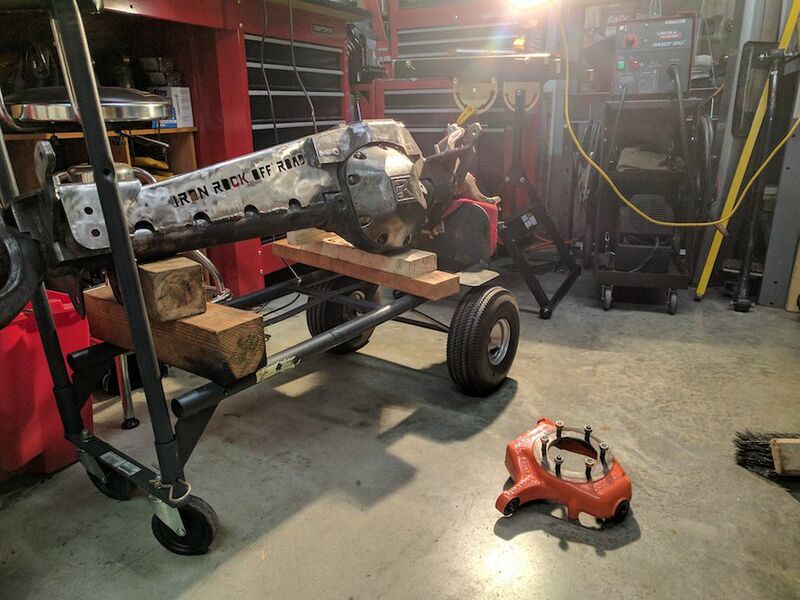 Got it home, started to clean it up, take it apart, and figure out what I am going to do now. The Reid knuckles won’t swap, but everything from the hub & brakes would, including the stubs. I would just sell the Reid knuckles and the Chevy spindles from the 30/44 setup. 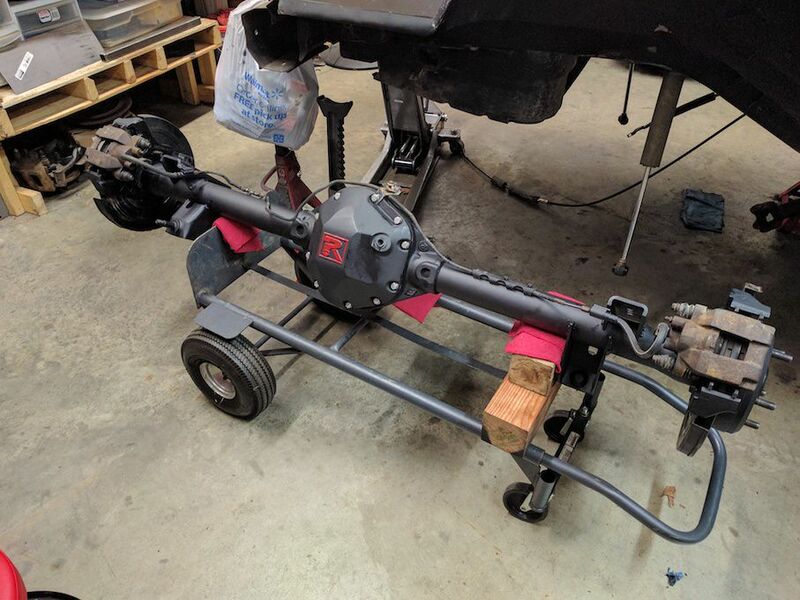 Since this is much wider and almost full-width, the rear axle would need some decent spacers or I’d have to swap something else in. I decided I’d wait on this and figure out what I’m doing with the front first, maybe I’ll shorten it. Last edited by XJsportG; November 9th, 2017 at 09:28. 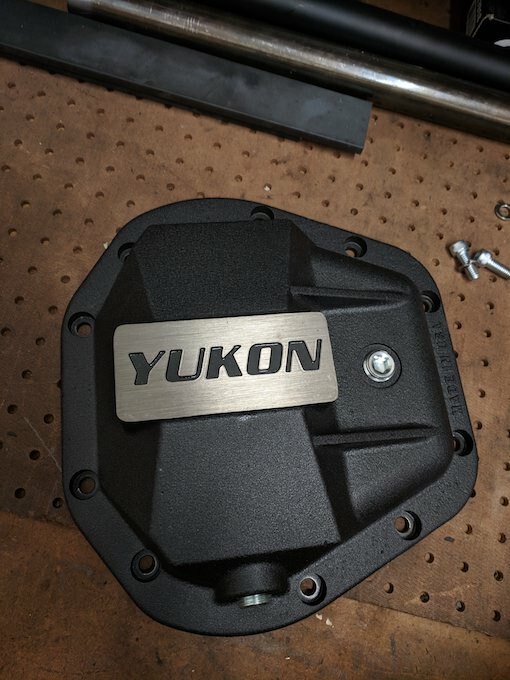 Also, in the meantime I had picked up a Yukon Zip locker that was brand new for a steal from a Facebook group, so that'll be going in. Now let me go into the details I had of the 4 options. This would have be the cheapest and easiest option. 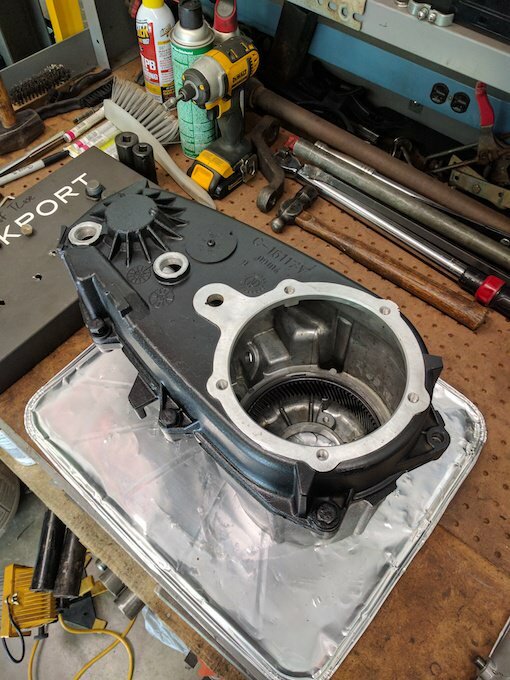 Clean up the housing, new ball-joints, new seals, bearings all around, re-gear to match the rear, and throw in an air locker. 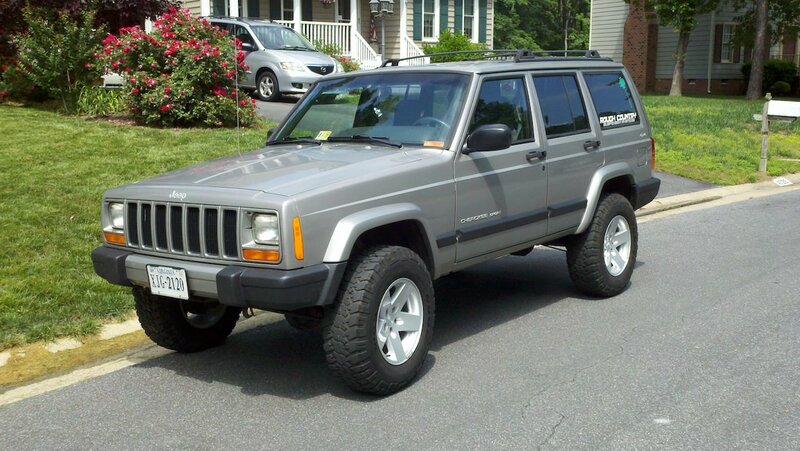 I'd then swap over everything from the hubs, brakes and stub shafts since I had all that already. Possibly upgrade to chromo shafts just to be safe. 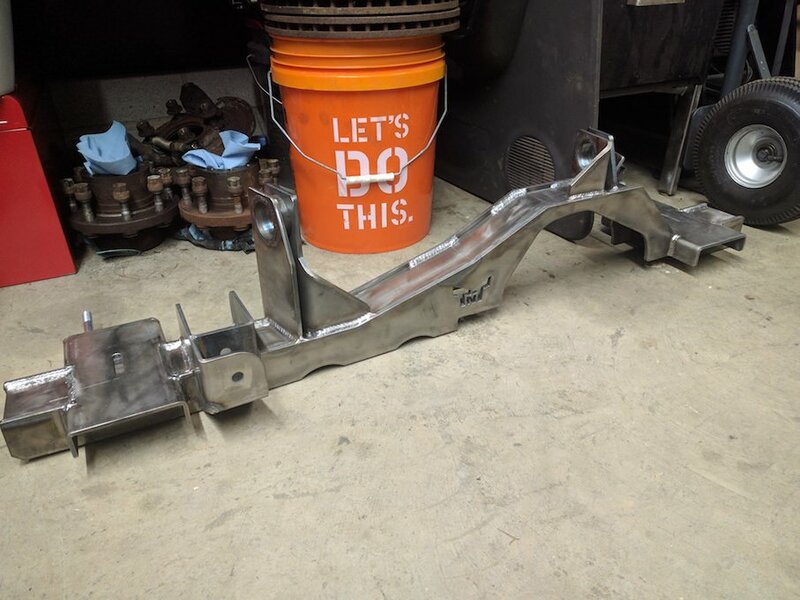 Would most likely use a TnT Dana 44 truss as it make it a direct bolt in to the XJ, or go cheaper and buy all the mounts seperaly from Clayton or Artec. 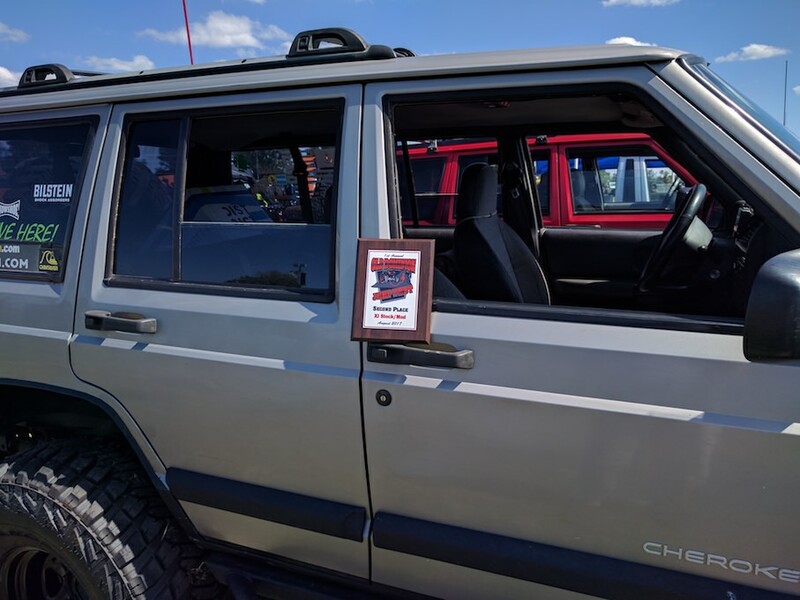 I got this idea while researching the 44 from D44Tech (http://d44tech.com/HP_Jeep_TJ.html). 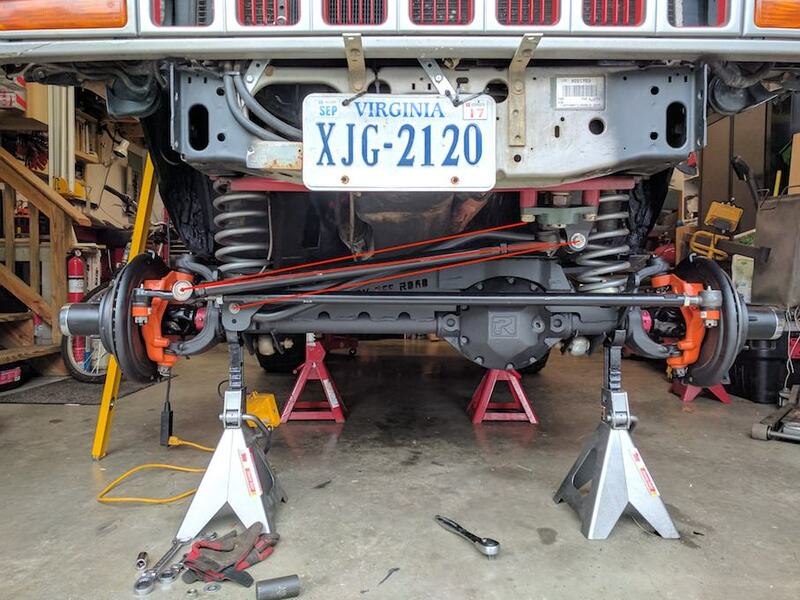 This guy a F250 verison of the same axle and narrowed it down to use Waggy 44 shafts and also customized a TnT Truss to work with it narrowed. I like this option more than 1 becuase it gave me a narrower track and I wouldn't have to do a whole lot or anything to the rear axle. Given the two options above, I was pretty set on going with one of the two. 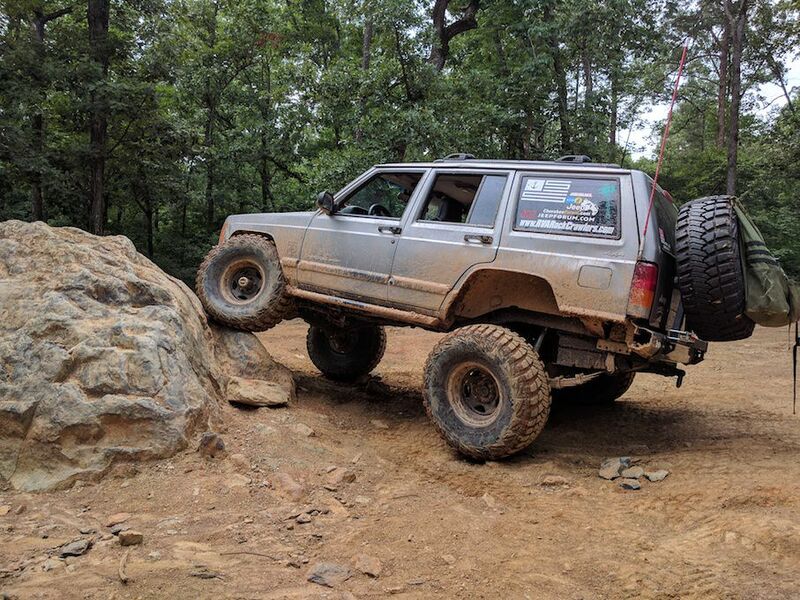 But as a lot of keyboard warriors argued, the 44 still uses the same u-joint as the 30 and is the weak link; I saw this first hand when we were at Uwharrie this past summer. 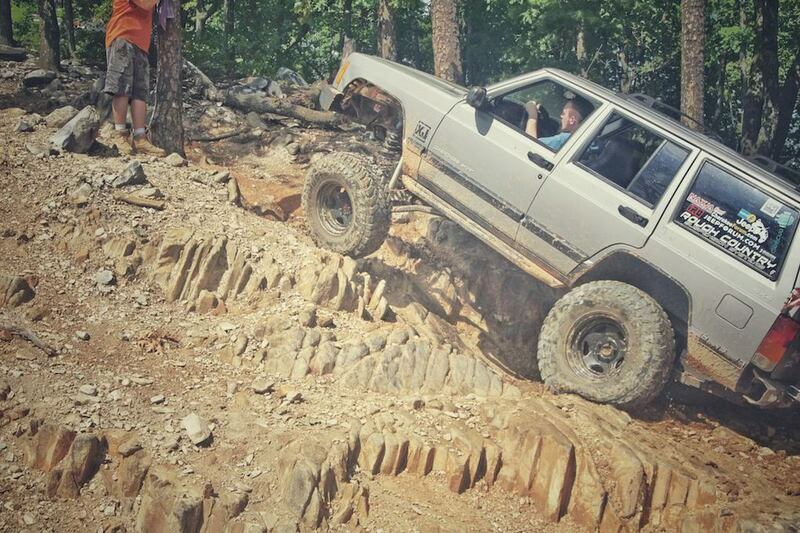 My buddies XJ with 4.88s, Zip locker, & 37s blew his whole driver knuckle apart climbing a ledge. 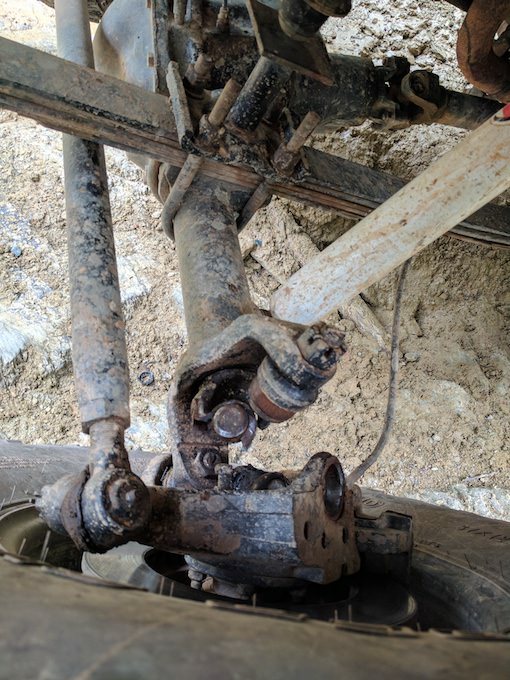 This could easily be solved with some CTMs or Superjoints but that just moves the fuse to some other spot in the axle. 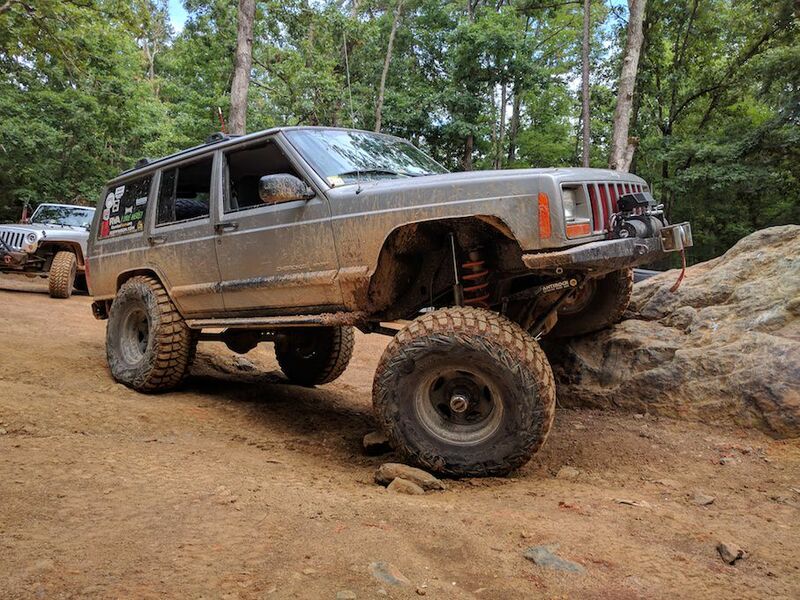 I know the 44 could hand 37s with it being built right and wheeling it right, but still worried. 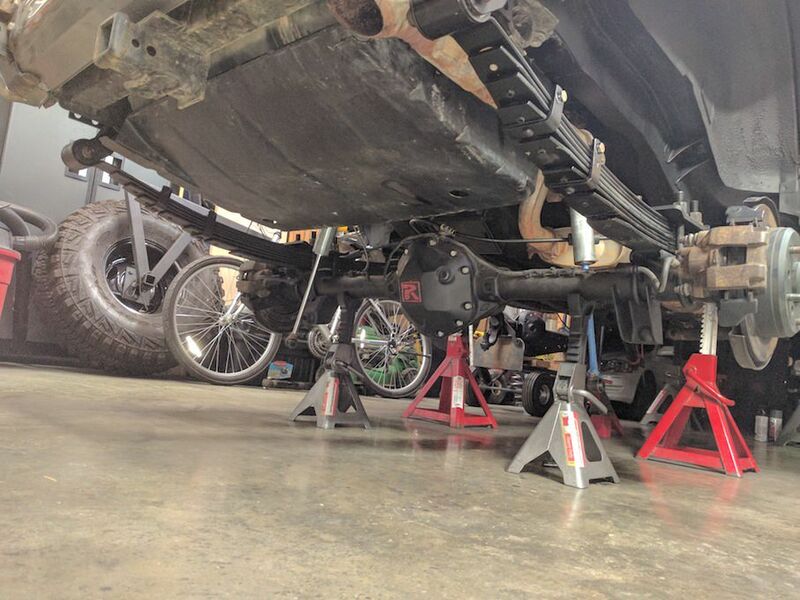 Also, when comparing axle shafts between a 30, 44, & 60; the 30 shafts almost look beefer around the yokes. And this is where option 3 came in. 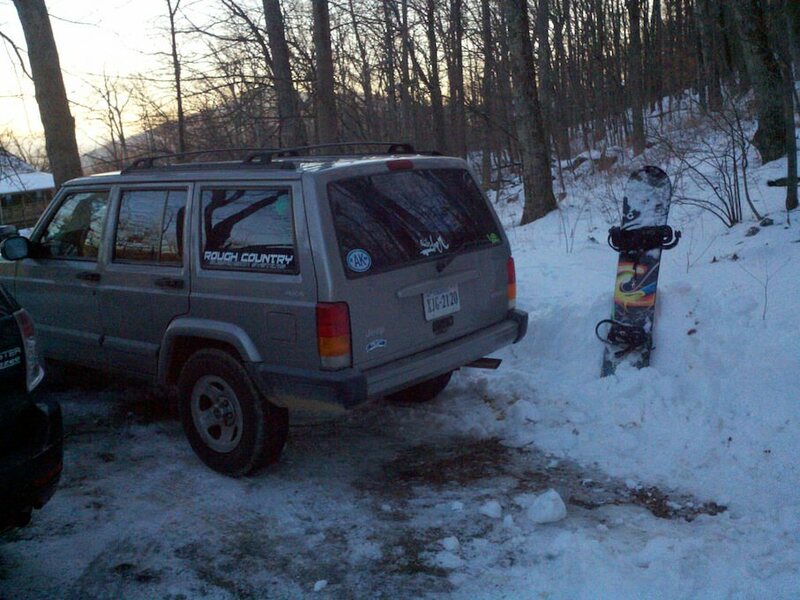 A lot of the smaller stuff could be bought used or from a YJ. Short part list I put together of the major components. Of course this is always an option and obviously this would be the most work/most exspensive route. 60/60 or 60/14b, thought about a TruHi 9" but ruled that out pretty quick. So where did that leave me? 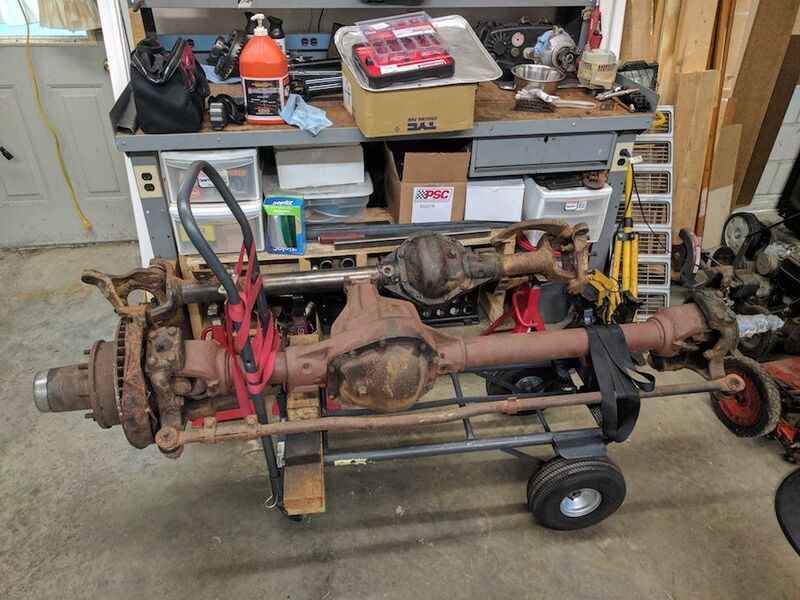 I have no idea, but I ended up with a 79 Supercab Dana 44, 2x 79 Snowfighter Dana 60s (1 complete, 1 housing only), and a complete 14bolt(10.5" AAM) from a 04 2500HD pickup. Thanks! I plan to add more parts numbers in a bit of the different options I had in detail. Which option did I decide to commit to? If you guessed anything other than option 4, you're wrong. Of course I ended up with 1-tons... Who would have thouhgt I'd end up here? 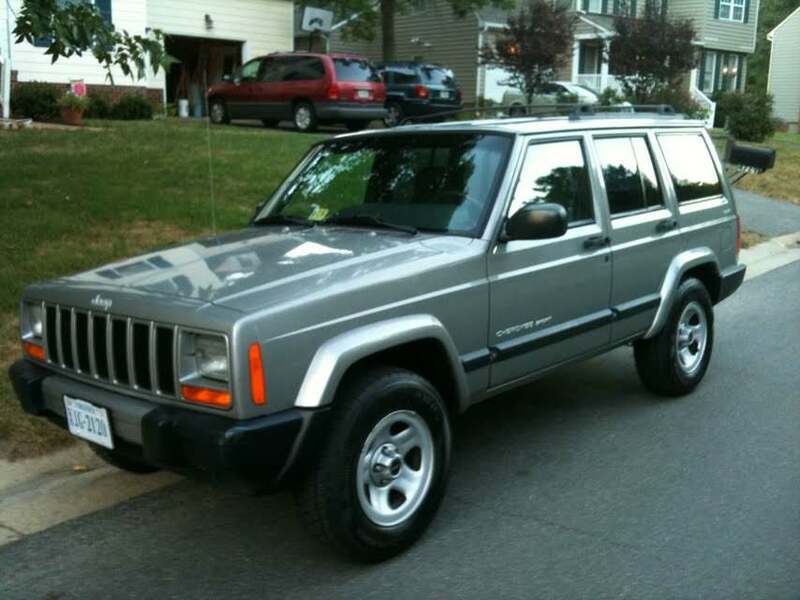 First up, I sold off the Supercab 44. 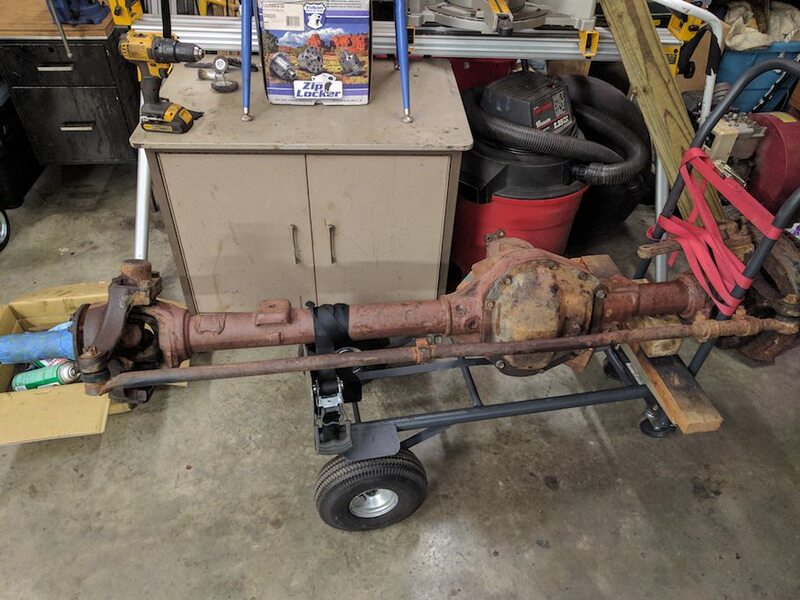 Really wish I held on to it for another project; just thought it was a cool axle. Next I would pull some parts from the complete D60 to use with the empty housing as it's already cleaned up and brackets were cut off. The empty housing came with a set of ECGS chromo 35 spline inner & outer shafts, with a set of Yukon Superjoints. 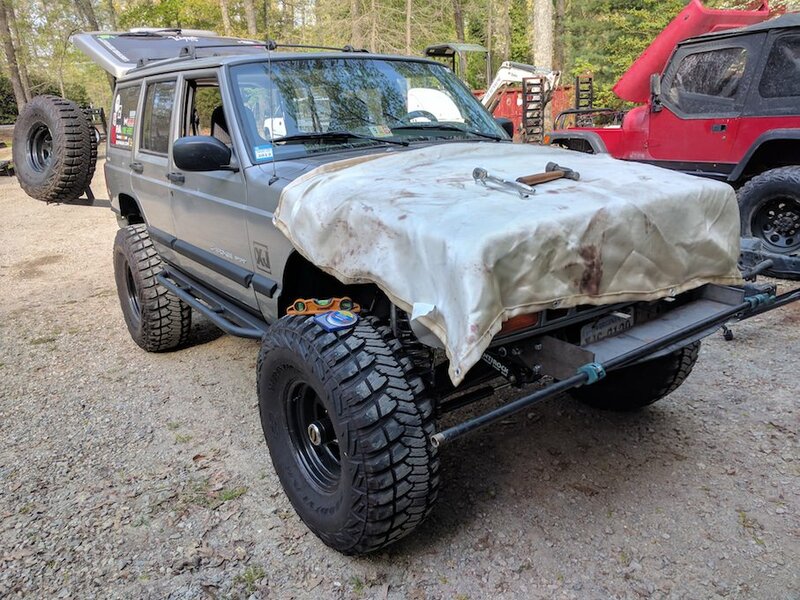 Going this route to save some money, instead of trying to source some parts new. 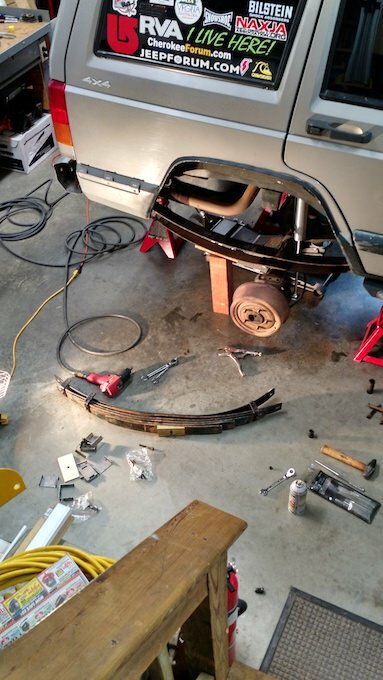 This doesn't go as planned as I was only able to get the hubs, rotors, and brake components. 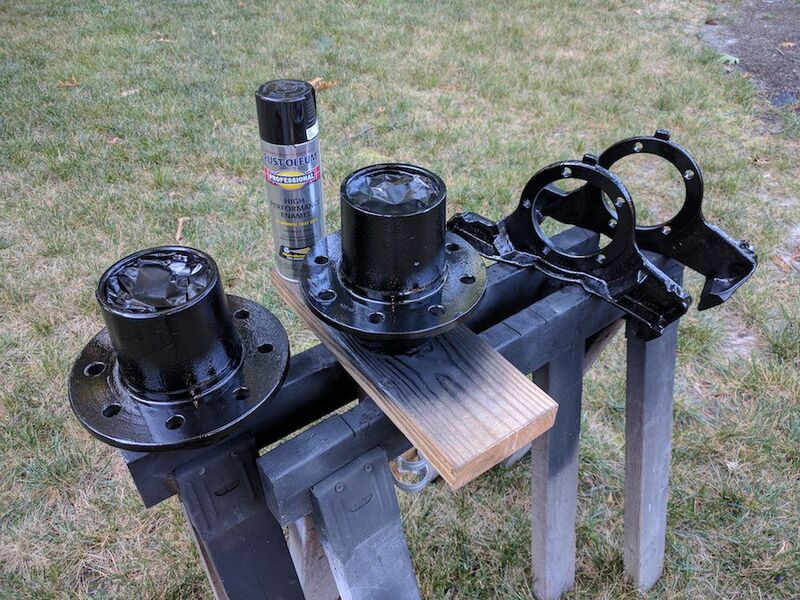 Cleaned & painted the hubs, brackets and shafts. ** BTW, Rustoleum Professional High Performance Enamel is awesome, glossy is super glossy and not normall my style but figured it would make cleaning a bit eaiser. May go with a semi-gloss if I can find out. Getting the spindles & knuckles didn't go as planned. One hub was already off and the PO had wrapped the spindle with a plastic bag and then with duct tape... 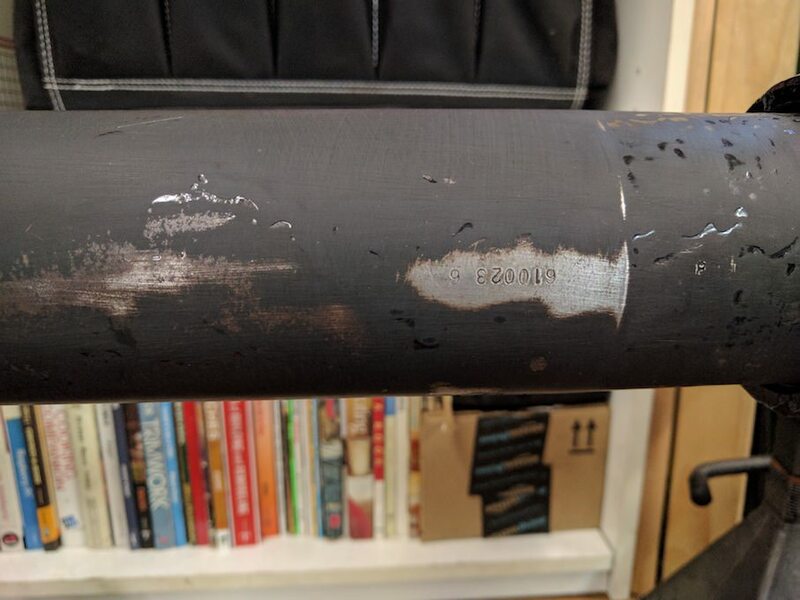 This wasn't air tight and moisture had gotten in between the bag and spindle, which cause some serious pitting and marking into the metal. I tried cleaning it up, but it was shot. 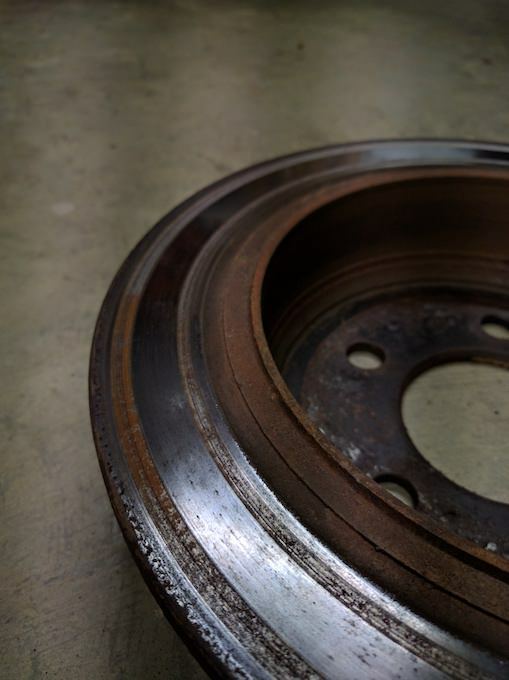 This left me with one bad spindle and a good spindle, since the other side still had the hub on with grease. I tried to get the knuckles off but the lower Kingpin bearing cap would not come out on either side. In fear of totally destorying them, I decided to look for alternatives. At this point I was already ordering a KP rebuilt kit, might as well order new caps. 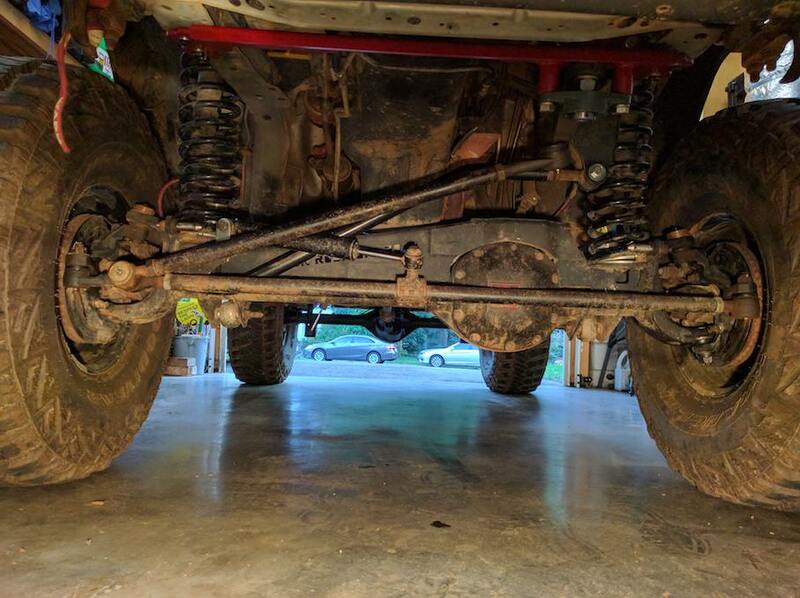 To retain more value in the axle, I decided to the leave the inner shafts instead of keeping them as spares. 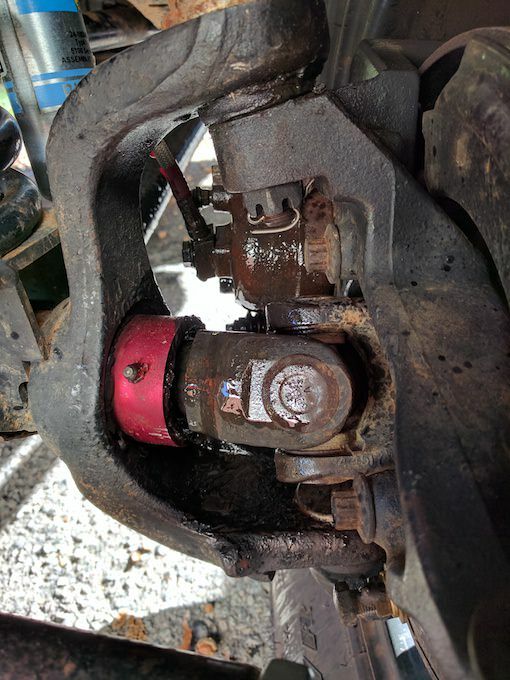 Ended up breaking even with axle after factoring what I sold it for and what it would have cost to buy the hubs, rotors, and all the brake components seperatly. 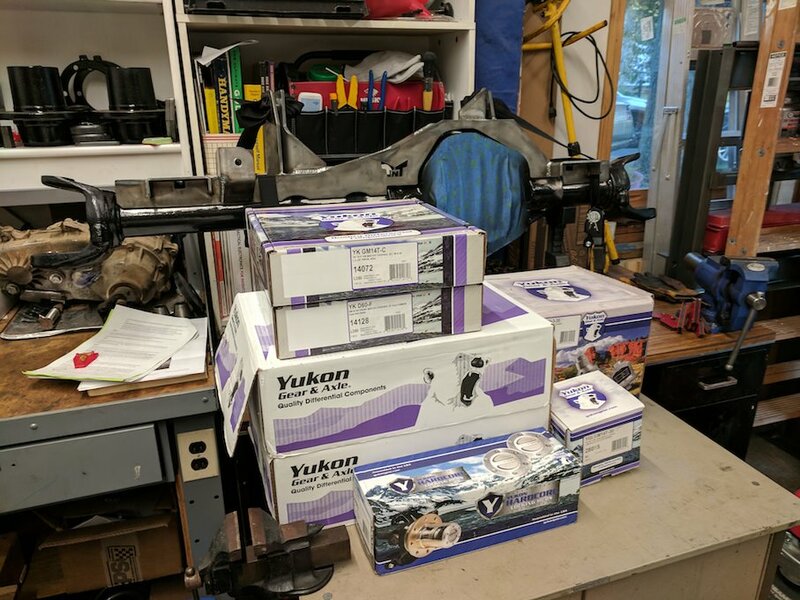 So I ordered a few things... and some smaller stuff not pictured. 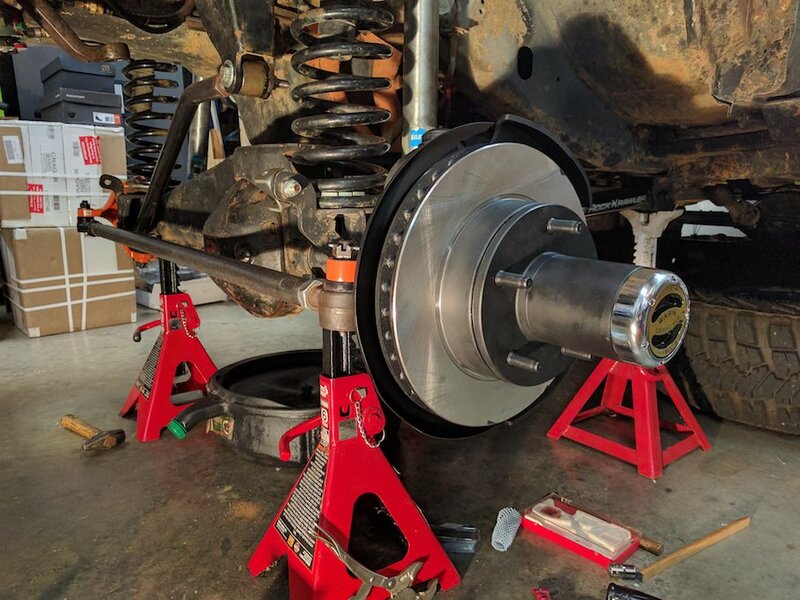 * Upgrade Disc to 3/4 ton? 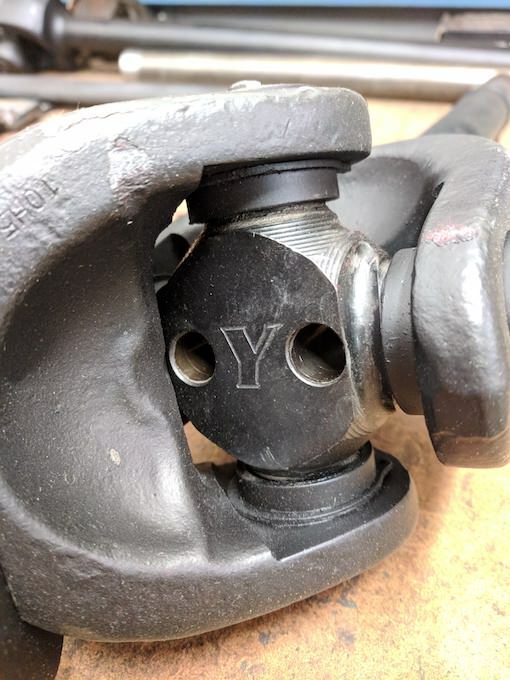 * Missing 2 wheel studs, stay with 1/2" or upgrade all to 9/16"? 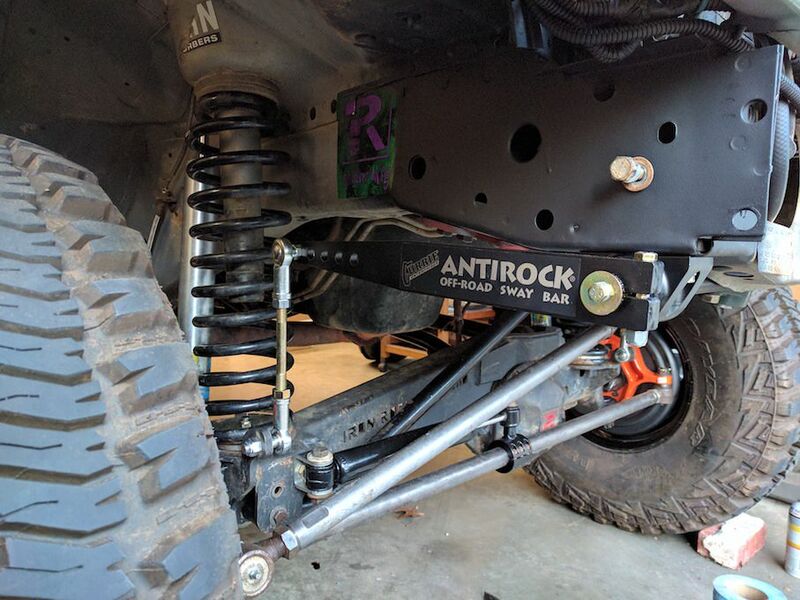 If you do any kind of high steer, you'll want to raise the trac bar mount on the TnT truss. Nice stuff, keep it up! 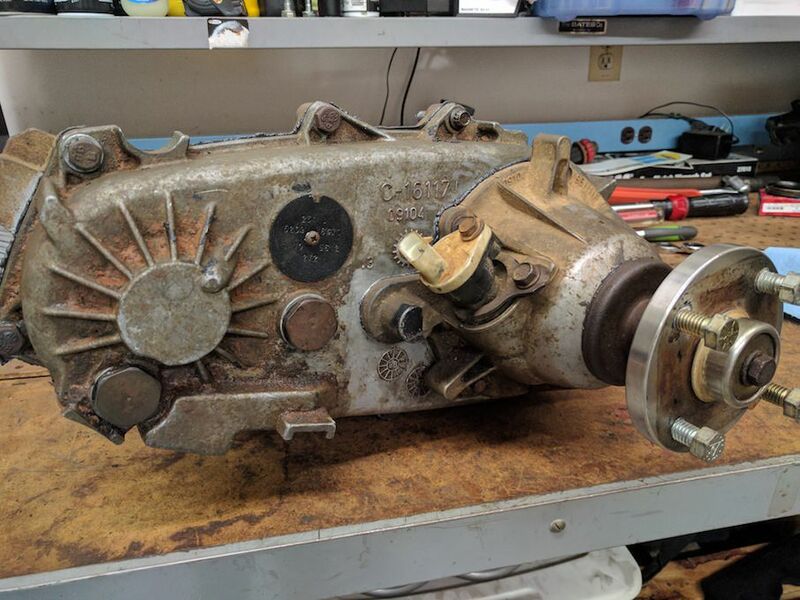 so what are you thinking with the dana 30 your taking out?